During this past five-year journey around the world, we’ve now spent about a half year of that time as passengers on cruise ships to get around the globe. While sailing from one continent to the next, we’ve learned so many cruise hacks and cruise tips during all that time out at sea. Cruises can be costly, but they don’t have to be. Having spent over six months on sixteen different cruise ships, across ten different cruise lines, we’ve become expert cruisers and have figured all the hacks to save money and avoid the many excess costs often incurred while cruising. We even pulled off the ultimate cruise hack by achieving what only seems impossible: A Cheap Cruise Entirely Around the World. We used a series of budget travel tactics in combination with many of the cruise hacks laid out in this article to cruise entirely around the globe on a budget of $60 per day (more on how we accomplished that is revealed at the end of this post). During all this time as cruise passengers, we’ve developed an arsenal of cruise hacks in addition to collecting many cruise tips that other savvy cruisers have passed on to us. From cruise wifi hacks to cruise packing hacks, we’re now happy to share these secrets of the sea with you. 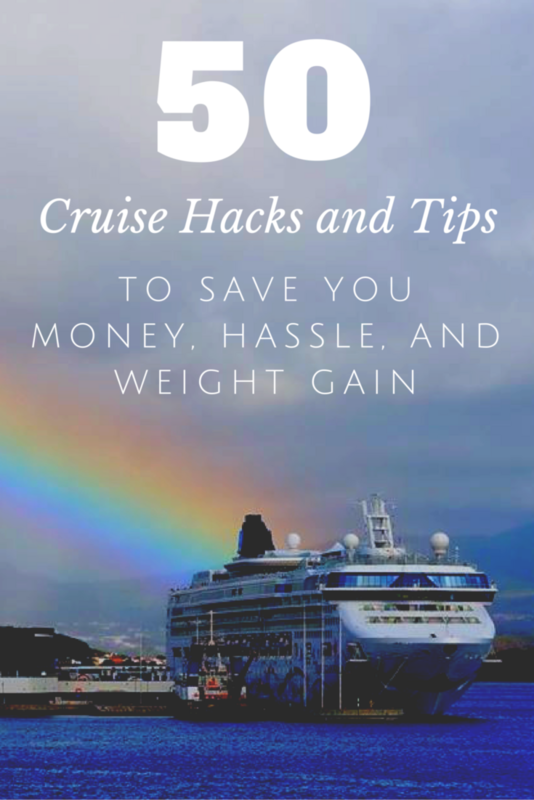 Whether you’re about to embark on your first cruise or are a seasoned cruising veteran looking for new cruise tips, we hope these cruise hacks help you to save hassle and money on your next cruise. Or maybe even help you to save a few pounds too! As we’re always looking for the best values around the world, one of the questions we receive most about cruising is when to book a cruise in order to get the lowest price possible. Like airfare prices, cruise prices tend to fluctuate greatly and there’s no surefire way to guess exactly how those cruise fares may change. But based on past booking patterns, it’s possible to have a pretty good idea of the direction that cruise prices may be trending. Often booking early is best. In other instances, last-minute cruise deals are a way to achieve rock bottom prices. Follow these tips when booking your next cruise and you’ll be sailing into an awesome deal. It’s a safe bet to book a cruise as early as possible to lock in a low rate. Booking a cruise more than a year or two in advance of the sailing often yields a very attractive price. But when booking early, it’s extremely worthwhile to continue monitoring the fares. If the price of a cruise changes, then you can usually change your booking to take advantage of the new pricing. Unlike when booking airfare, most cruise fares are cancelable and changeable up until a month or so before the sailing date. So after booking a cruise, keep a watchful eye on those prices. If you find a more attractive offer to the cruise you’ve booked, call your booking agent immediately to have them either change your reservation or to cancel the old reservation and rebook the better deal. Don’t only monitor cruise fare prices. You may see prices are remaining the same, but there could be attractive promotions that make it worthwhile to alter a cruise reservation. It could make sense to rebook your cruise if you later notice valuable promos being offered, such as prepaid gratuities, complimentary beverage package, onboard credit, or free cruise wifi minutes. Cruises usually offer free cancelation as long as you do so before the cancelation period, which varies by cruise line and itinerary. (Note: there are certain early fares like Carnival’s Super Saver, that are non-refundable. So when booking, verify with a booking agent that the early deposit is indeed refundable.) Typically the cancelation period for a cruise is a month or two before the sailing date, so you can usually cancel without penalty anytime before then to rebook the better deal you’ve found. Be diligent to check the price often or consider paying for a service to alert you of price drops. Whenever we book a cruise, we simply bookmark the cruise listing and check it frequently for price changes. If that sounds tedious, websites like cruisefaremonitor.com will do this for you for a small fee. Although if you have a really good travel agent, that’s something they can keep an eye on for you. Yet even with tracking services, we still recommend monitoring prices manually. Although cruise fare monitoring services can alert you to a change in prices, they are unable to track and compare all the different promotions that may be on offer. Getting last minute cruise deals can be tricky and a bit of a gamble. But that gamble often pays off with slashed prices on undersold itineraries. If you don’t have a strong preference on a particular ship and just want to go cruising at a very low price, booking last-minute can be a good strategy to accomplish that. The timing of the cruise will help to increase your odds of securing an incredible cruise deal. For example, September through November Caribbean sailings can often be a good bet to hold off until within 45 days prior to the cruise to book a fantastic last-minute cruise bargain at a non-cancelable rate. We’ve seen weeklong last-minute Caribbean itineraries out of Florida during this time for as low as $199! With most things travel-related, we often advocate booking directly with the company for the best price. Middlemen can take a cut and inflate travel prices. But this is absolutely NOT the case when booking a cruise. We always suggest booking with a third-party instead of the cruise line directly. In doing so, they can frequently find perks, bonuses, and occasionally even lower prices. Sometimes 3rd party travel agencies buy a block of cabins that they resell. If the agencies feel the need to unload them, they can be aggressive with pricing and promotions that can even beat what the cruise line is directly offering. For example, we booked one of our last cruises, sailing on the beautiful new Norwegian Bliss, by finding an attractive rate on CruiseDirect that included a perk of $100 onboard credit, which none of the other online agencies were offering. Regardless of whether you book early or late, always consider off-peak cruise times to secure the best cruise prices. If possible, avoid Spring Break sailings. You’ll not only save money but will also save yourself sanity by avoiding hell-raising kids and drunk college-age partiers. Similarly, it can be a wise call to avoid winter holiday sailings and peak summer sailings. A simple rule of thumb is to book cruises when school is in session, if possible. Some great cruise bargains can often be found in early Fall, soon after kids go back to school. During this early autumn time frame, the weather tends to be nice & warm in most cruise destinations throughout the world. Although, do beware that this time is still in the midst of the Atlantic hurricane season. Yet fall makes a particularly great bet for those last-minute cruise deals we mentioned earlier. When booking last-minute, then you’ll know if there’s a hurricane threat at the time. Another good period to book a cheap cruise deal is the weeks in between Thanksgiving and mid-December, particularly for Florida and Caribbean sailings. During this time frame, there tends to be an influx of ships that have been recently repositioned to Florida, yet people tend to avoid traveling during those pre-holiday weeks. With more ships around in a time when cruise passengers are decreasing, this leads to an excess supply of empty cruise cabins. And that’s always a great recipe for prices being slashed! 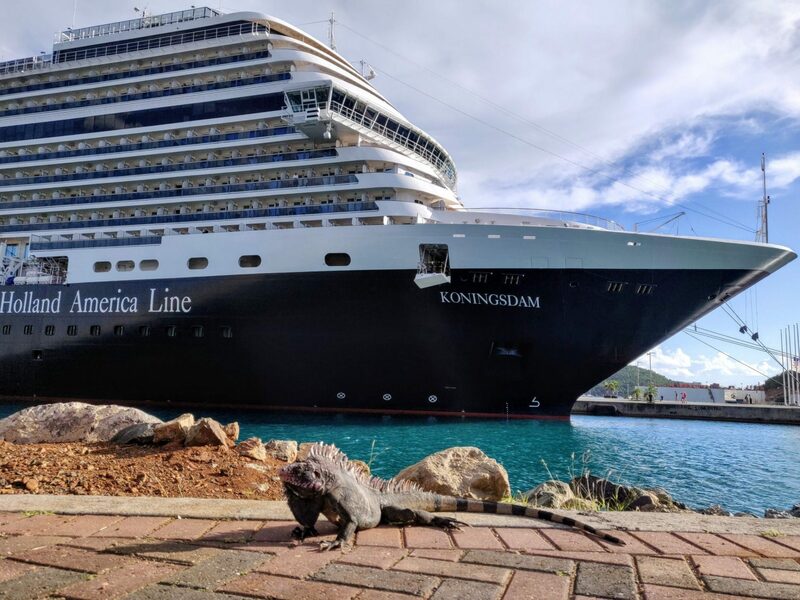 We most recently used this strategy to snag an awesome two-week Eastern Caribbean cruise deal on the Holland America Koningsdam during this early December period. By buying during a Cyber Monday promotion, we further parlayed prepaid gratuities, onboard credit, and beverage cards all on top of the highly discounted $500 cruise deal. It was a total steal! We’re big proponents of booking what’s called a “guaranteed stateroom” to get the absolute lowest price on whichever cabin type you’re interested in (inside, outside, balcony, suite). With a “guaranteed” cabin, you are guaranteed a room within that particular type of stateroom range or higher. You simply do not get to the choose the cabin’s exact location on the ship. The cabin location will be assigned to you prior to your cruise departure. Booking a guaranteed cabin can perhaps be a very slight risk. Naysayers will cite the potential of being placed in undesirable areas such as under a nightclub, galley, or in the ship’s bow. We always book “guaranteed” and have never been assigned one of those undesirable places. Quite the contrary, actually. It’s always been better! 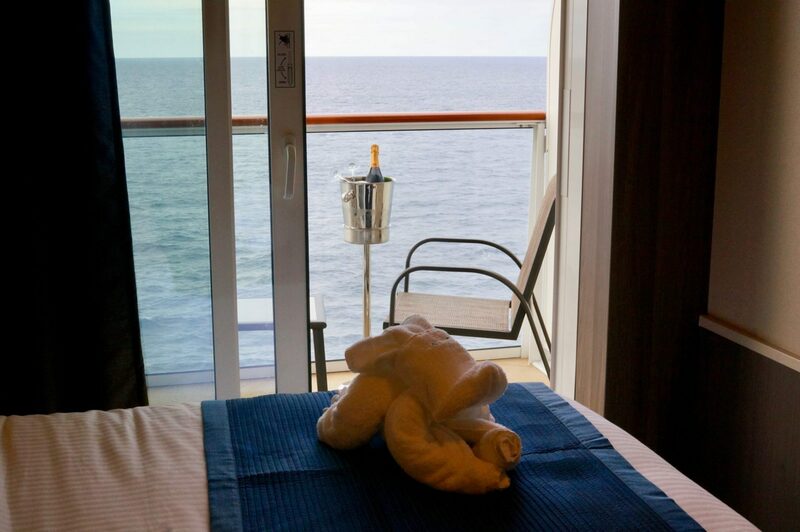 We once even booked a guaranteed inside cabin and ended up in an awesome balcony stateroom. We believe that you stand a much greater chance to be placed in one of the many great locations on the ship, rather than a bad one, and you could even score an elusive free balcony upgrade as we did. The one thing to keep in mind is that these guaranteed cabins always have the absolute lowest price. So if you’re a price-sensitive cruiser like us, and simply looking for the best cruise deal, then booking a guaranteed cabin is a great way to help accomplish that. With cruises tending to have an endless array of incredible food to gorge on, from decadent desserts to the midnight buffet, you may worry about your waistline expanding during all those wonderfully gluttonous meals at sea. But you’re on vacation. It can be fun to indulge! So use these simple cruise hacks to enjoy all of that fantastic cuisine, without disembarking ten pounds heavier. Yes, really. Just do it. 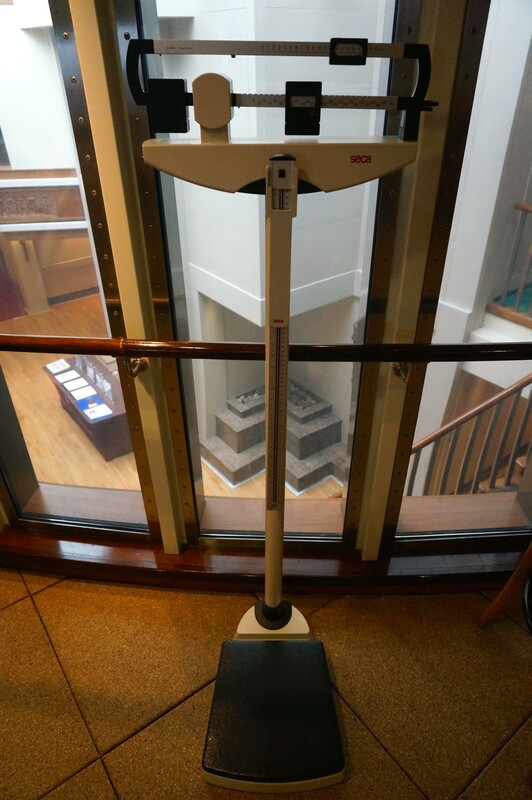 You can always find a scale in the cruise ship’s gym or the medical office. Find that scale to weigh yourself, even if you have no intentions of using the gym during the rest of your voyage. Weigh yourself as soon as you get on board so you can keep tabs of any weight gain during the cruise. This a particularly good idea if you’re on a longer itinerary. After your initial weigh-in, be sure to weigh yourself periodically throughout the remainder of your cruise. By doing so, you may actually find that you’re not packing on the pounds as much as you feared. So this can give you a well-deserved excuse to have a cheat day of gluttony. 7) No Need for the Gym When You Can Use Stairs! You’re on vacation. There’s no need to spend it at the gym unless you really love a good workout. Instead, simply hold firm on always using the stairs. 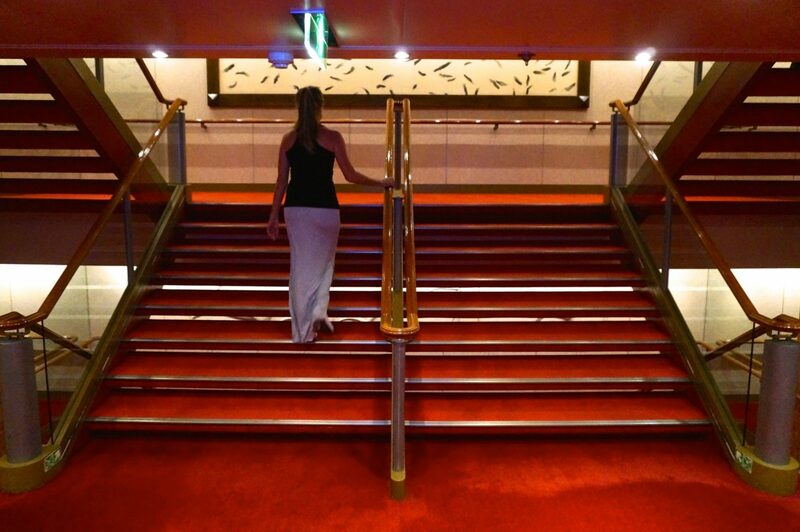 Most large cruise ships have a minimum of 10 passenger floors (often more). Set a rule to never use the elevator and you’ll end up burning lots of calories simply by trying to get from one place to another on these megaships. Often you’ll get there faster too. That holds particularly true if your cruise ship has many elderly passengers who must use elevators or kids who like to press buttons. If your cabin happens to be on the bottom floor, simply taking the stairs up and down to the lido deck for lunch will burn approximately 100 calories, based on the estimate of 5 calories burned per flight of stairs. 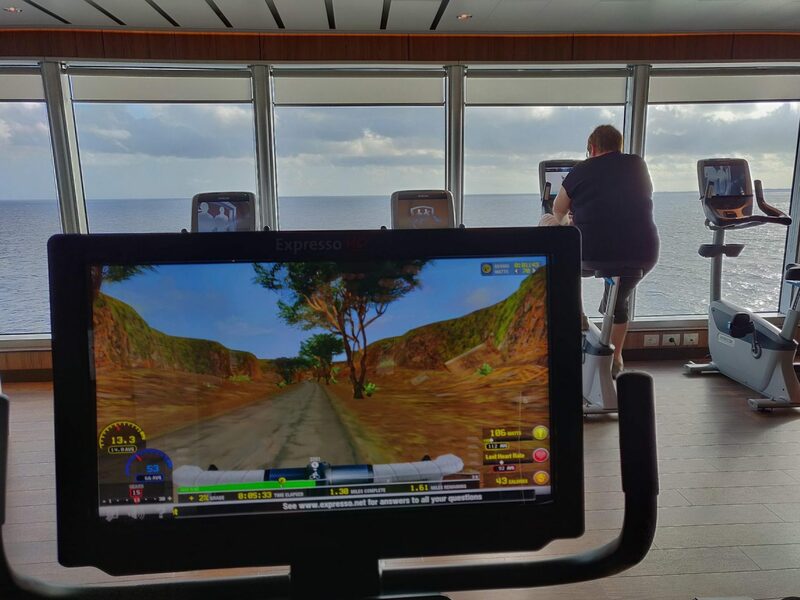 Considering that you’ll likely be making multiple trips up and down the ship’s stairs throughout the day, you can realistically burn several hundred calories just by going about your normal day aboard the ship. So go ahead and get the chocolate lava cake! Take your FitBit or bring along an inexpensive pedometer like this which will track all your steps and calories burned too. You may be surprised at just how much walking you can inadvertently do on a big ship! 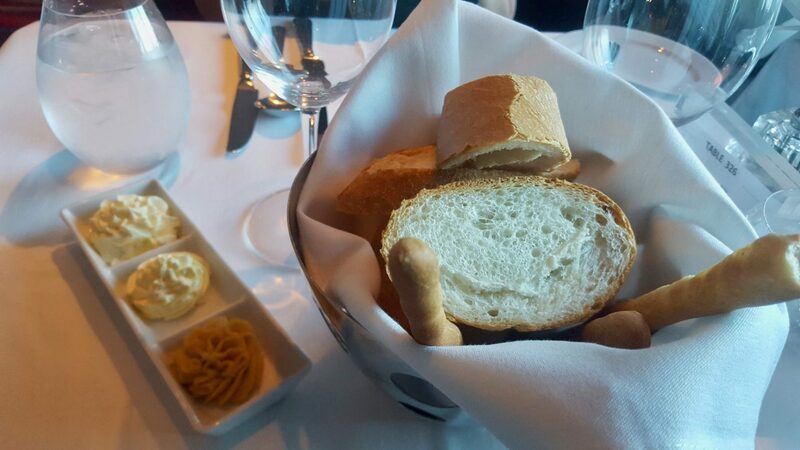 A lovely basket of bread is always immediately delivered to your table upon getting seated for dinner. It’s so easy to butter up those tasty rolls and load up on all those carbs before your appetizer has even hit the linen. As a result of eating all the pre-dinner bread, you may even find yourself too full to finish whatever delicious main course you’ve chosen to dine on for the night. To avoid that fate, make a special request for your server to only bring out the bread basket when your main course is served. Remove that carbtastic temptation from the table prior to your main course. If you’re still hungry while eating your meal, go ahead and have some bread. You won’t gorge yourself with this filler as you would have prior to your meal’s arrival. Save your appetite for the main course and forgo the seduction of all of those unnecessary carbs, before your meal. In today’s digital age, there are many tech-savvy cruise hacks to stay abreast of before your sailing. These cruise hacks and tips will help you avoid drained batteries, make the most of cruise wifi, and keep you connected while out at sea. With only one or two electrical outlets in most cruise staterooms, this poses a problem to keep all those cameras, phones, tablets, and laptops charged. It can be very wise to pack a compact travel adapter in order to charge multiple devices and avoid drained batteries. But power strips with surge protectors are actually banned from cruise ships, as they pose an electrical hazard. If you bring one, they will get confiscated from your luggage and returned at the end of a cruise. Yet this special Cruise Power Strip solves that issue, as it is a power strip that was designed specifically to be compliant with all the major cruise lines. Power strips with built surge protectors or extension cords is what poses and issue and gets flagged in luggage. So this Ship-Approved Power Strip excludes that and is completely permissible to plug into the outlets of all the major cruise lines. It turns one outlet into three, plus two USB ports! So it gives the ability to charge five gadgets at once. We never travel without such a portable power adapter. Check the 5-star Amazon reviews here. Most cruise lines now have their own app that you can use onboard complimentary. Simply connect your phone to the ship’s wifi network and you’ll be able to use this app without incurring any wifi charges. 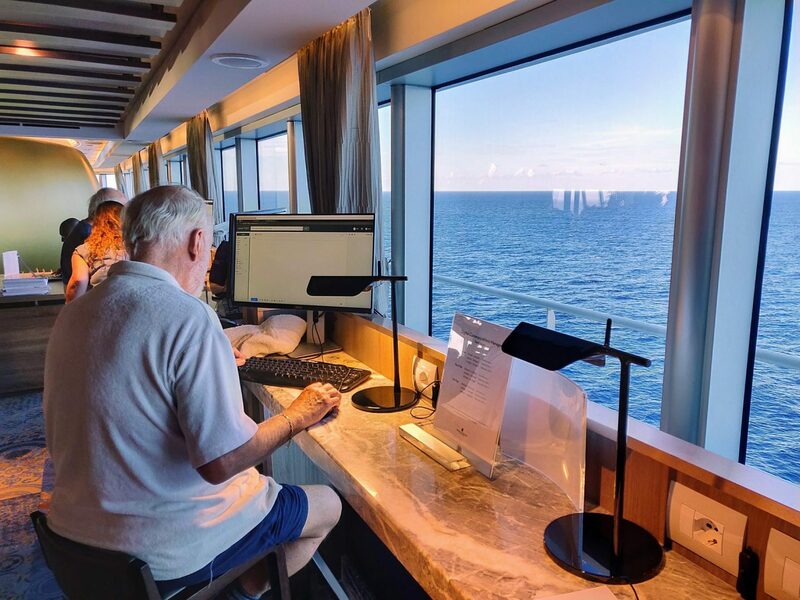 These cruise apps are free to use for tasks such as checking your onboard account balance, browsing the day’s up-to-date activities, reading up on your next port, checking menus, accessing a ship map, or even making dinner reservations. Be sure to download the app prior to your voyage so that you don’t incur wifi fees or roaming charges that you’ll otherwise get hit with if you wait to download the app while at sea. Here’s a listing of the major cruise line’s app to download before you embark. It has been a long-used cruise tip to bring walkie-talkies like these onboard cruises to be able to communicate with your cruise mates during the voyage. It makes it easy to meet your friends or family members while going separate ways on these massive ships. But you can now forgo using this dated technology and instead communicate using the cruise line’s app. This capability often comes with a fee, but that fee will likely cost less than the price of a pair of walkie-talkies. And the messaging app will work better too. So how much do these cruise messaging services cost? It can vary by ship and even by each individual cruise itinerary. But to give some indication of costs during a recent sailing, Norwegian’s app – Norwegian iConcierge – offered messaging service for a one-time fee of $7.95. This allowed for voice calls and text, through the app, to fellow passengers during the entire cruise. It was a 13-day cruise, so that came out to less than a dollar per day. We find it to be a surprisingly fair price for this messaging service. Wifi can be extremely expensive onboard cruise ships and it is notoriously slow. 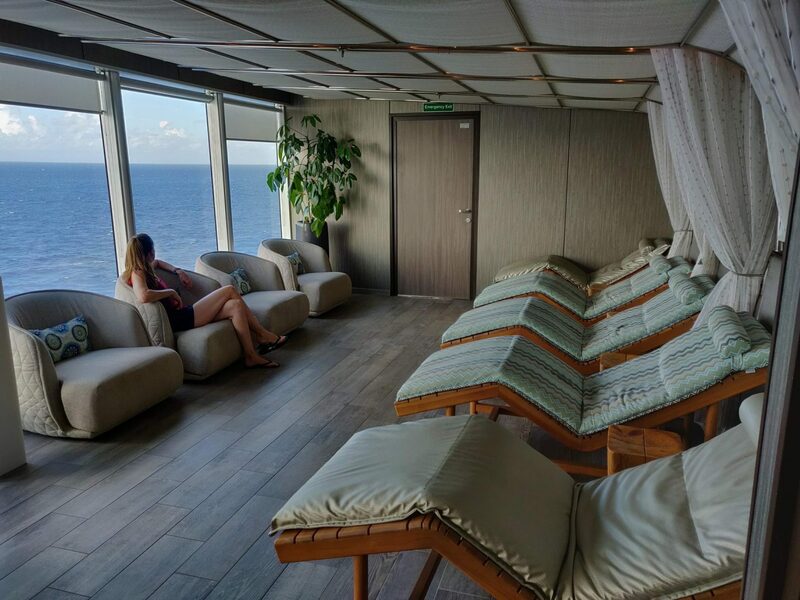 During a recent sailing with Norwegian, we found rates of $0.95 per minute and the least expensive package was $9.95 for 15 minutes. Eek! Unfortunately, there is no easy way to hack the cruise wifi network to get free wifi on a cruise. 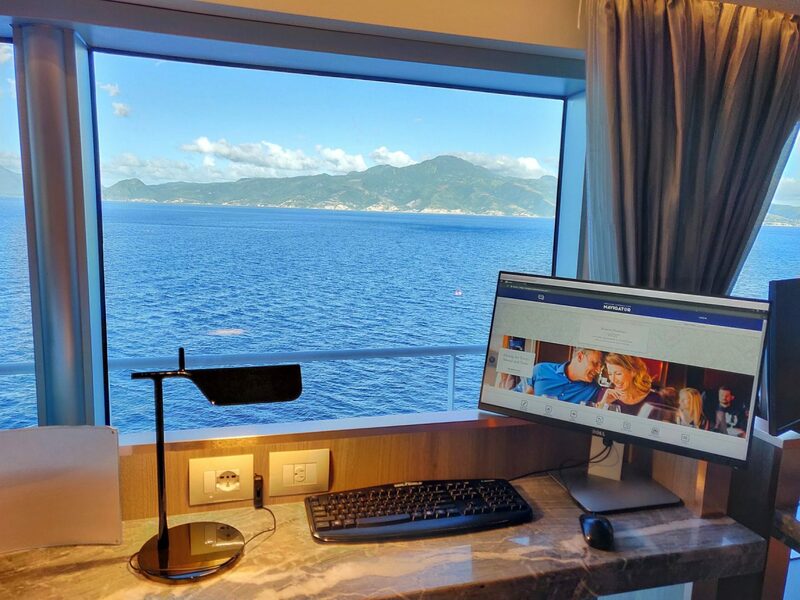 But there are easy ways to exploit cruise wifi, extend it, connect multiple devices to the same account, and even get a just a bit of free wifi on certain cruise lines. 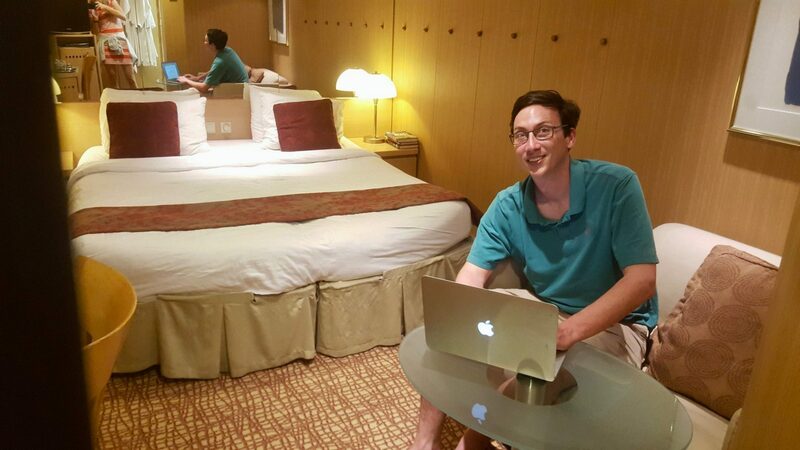 So here are some tried and true cruise wifi hacks to minimize your cruise wifi expenses and maximize your time online during your cruise. You can find nominal savings on a wifi package if purchasing it before your cruise. Typically most cruise lines give a 10%-15% discount if you book a wifi package before you get on the ship. You can find these discounted wifi packages by logging in to your online account directly with the cruise line, before your embarkation day. It’s there where you browse the different wifi packages the cruise line offers for your specific itinerary. Also, before booking a cruise, keep an eye out for promotions that may even include a free wifi package. Free wifi on cruises is becoming a more common promotion that cruise lines are offering to tempt you to book. But even these free wifi cruise offers will usually limit you to something like 100 or 250 minutes. It will be clearly stated, but don’t expect to score unlimited free wifi on a cruise. 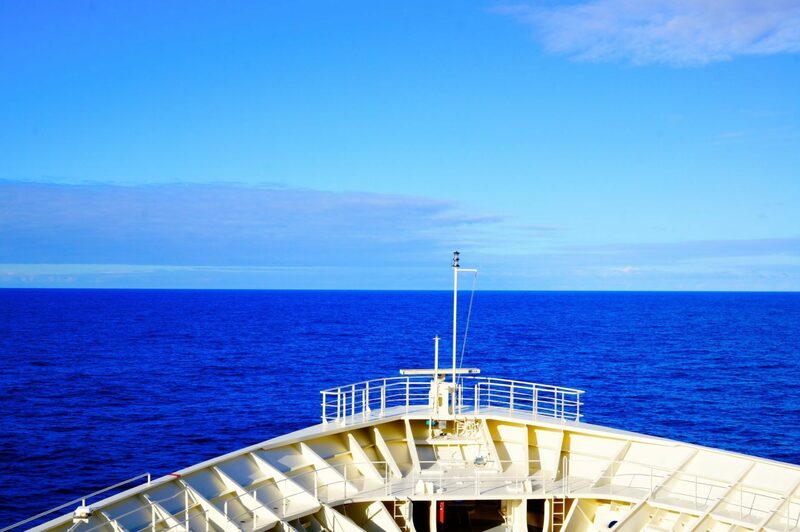 We can only dream that free unlimited wifi will become a reality at sea one day. Be sure to enable the wifi on your phone even if you don’t intend to purchase a wifi package. On some cruise lines’ wifi networks, push notifications have been known to slip through. We have regularly experienced this firsthand. So put your phone on airplane mode, then enable your wifi to potentially receive push notifications. You won’t be able to respond to any notifications without having an internet package. But it can still be a nice albeit tiny perk to be able to receive push notifications on your phone, free of charge. Some ships’ wifi will only deduct usage from your account if you’ve been logged onto the wifi for 30 seconds or more. We first discovered this when logging on to Celebrity’s wifi for 29 seconds or less and noticed it didn’t deduct any minutes from your usage. So you can use the wifi for free if you’re able to keep your session under a half-minute! Just be careful to watch the time ticker and act quickly! When using Holland America wifi, it also didn’t deduct any usage from our account when using it for less than a half-minute. Not all cruise lines use this practice though, as we discovered using Norwegian’s wifi even a second, it deducted an entire minute. But this cruise wifi hack is definitely worth testing this out on your next cruise to see if you can use 29 seconds of wifi for free. While you admittedly can’t do much browsing in that very short amount of time, it is a great way to quickly pull in new emails or send out a prewritten email. Similarly, you can pull up a webpage within those 29 seconds, then log off and read the content after you’re logged out. This can be a great cruise wifi hack if you only need to occasionally check or send emails. If you did purchase a cruise wifi plan, use those minutes at times such as late at night or early in the morning. Or consider using them during peak meal times and during a popular show. You’ll find the speed to be blazing fast compared to other periods. These off-peak times may vary by ship and itinerary. Ask the Internet Desk Manager for the best times to log on. Pro-tip to test wifi speed on a cruise: Use a cruise’s complementary sites to assess how quickly the free pages load. For example, on Holland America, they provide complimentary access to nytimes.com. So we use the ship’s online portal to browse the news site for free. We’re doing so not to actually read the news, but rather to simply to gauge how quickly those NY Times pages are loading. When they load fast, we know this is a good time to actually log on to the paid wifi to get more efficient use of our limited wifi minutes on the cruise. If the Internet is painfully slow (as it often is), do inform the Internet Desk Manager of your troubles and he or she will almost always reinstate the minutes used during your sluggish wifi session(s), no questions asked. Sometimes cruise ship’s wifi systems become overloaded or have outages, leaving passengers to squander those expensive wifi minutes they’ve paid for. If the Internet is really bad and you find yourself waiting five minutes for a page to load, it is unfair to be charged for that when wifi minutes on a cruise are so costly. If you do have a legitimate wifi problem on your cruise, don’t hesitate to visit the Internet Desk Manager to get it fixed and have those cruise wifi minutes refunded. For example, during a recent transatlantic cruise on the Norwegian Bliss, I once logged in and pages didn’t load after several minutes. I made a few different attempts to use the cruise wifi. Each try, it unnecessarily burned through the precious small allotment of wifi minutes. When I addressed this with the Internet Desk Manager, he confirmed that there was a satellite outage. So he credited the lost wifi minutes from those sessions back to our account. Such instances are usually only credited if you are proactive in requesting them, never automatically. So if you experience a session in which pages aren’t loading, be sure to speak up. Wifi on a cruise can be pricey, but you can always wait until you’re in port to connect for free. There’s almost always a place to connect to wifi right at the cruise terminal where you’re docked. However, those in-port terminals are often for a fee and can be expensive. Occasionally they’ll have free wifi, but such connections will be painfully slow since many passengers and crew will all be trying to log on at the same time, clogging the network. Instead, walk a few blocks away from the cruise terminal to find free wifi with better speed. Go to a local cafe, a bar, or even a fast-food restaurant. Even some malls or town plazas will have free wifi. Sometimes the port maps you can get from guest relations on the cruise will have such free wifi places marked. If not, ask your favorite crew member where he/she goes to use the wifi. If you’re on a ship with a regular itinerary, crew members will know all the best places in port with free wifi and fast speed. Also while in port, consider using the data plan on your mobile phone to connect to the Internet. Before you cruise, be sure to check your phone carrier’s international roaming coverage. Some carriers, such as T-mobile or Google Fi, provide free data and texting in over 170 countries. That’s exactly what we use and it has worked very well for us all over the world. Using your phone data plan is not just limited to land either. When we’re cruising through areas within a few miles of the coastline, it’s possible to connect phones to have Internet access through mobile data while on the cruise. When on the cruise, take a look at the route map to note if you’ll be passing by any islands where you may have data coverage. For example, during a sea day on a recent Caribbean cruise, we noticed that we were passing within close proximately to a Bahamian island. So we strategically checked our phone’s data signal when we got close to that island and was indeed able to access the Internet for nearly an hour since Google Fi’s coverage extends to the Bahamas. In addition to always having data while in port, we often had data on our phone while cruising through the Panama Canal, in Alaska’s inside passage, cruising along the coastline of SE Asia, and even while cruising through the Suez Canal in Egypt. If you already have an international roaming plan, this is a great free way to access the Internet on a cruise. You can even tether your phone data to a laptop or other device while cruising near land. Be sure that when you’re attempting to access land-based mobile data, that you do so outside on your balcony or on deck. We’ve found the cruise ship walls can sometimes block data signals from land. If your phone carrier doesn’t include free international roaming, consider making the switch to the new Google Fi phone plan, which includes international roaming in nearly every country where cruises go. The best part is that a Google Fi plan is only $20 per month, plus just $10 for every gig of data used. And there’s no contract so you can use it just for a month or just for a cruise and cancel. (Although it’s worth keeping as your main phone plan.) If you’re new to Google Fi, you can use our referral link below to get a $20 Fi credit, essentially giving you your first month free. Then you’ll only be paying for $10 per gigabyte in data when on or near land during a cruise. And even a single gig of data will likely be plenty to stay connected on or near land, unless you’re doing something excessive like streaming Netflix. When purchasing a cruise wifi package, passengers are only permitted to connect one device at a time. So when there are two (or more) people in the same cabin, they cannot be logged in at the same time. Similarly, if you want to connect your mobile phone and your laptop at the same time, this cannot be done simultaneously. For either of these scenarios of connecting multiple devices, you would need to purchase multiple wifi packages on the cruise. All you need to do is pack a wireless travel router, like this one. Once on the ship, set the device to “bridge mode.” Then it can be paired to the cruise wifi network to create a new mini wireless network right within your cruise cabin. Essentially it acts as a wifi repeater, allowing you to connect all your devices using only one wifi package. Doing this cruise wifi hack works particularly well if you have an unlimited wifi package during your cruise. Set up your own localized network in your cabin and just let it run during the entire length of your cruise. Then you can connect as many phones, tablets, and laptops as you’d like. All of those devices will remain connected whenever you’re in your stateroom. It’s super easy to use and usually is priced at less than $50. Meanwhile, if you were to purchase a second unlimited wifi package, it would cost hundreds of dollars. So a wireless travel router easily pays for itself and it can be used similarly in hotels that charge for wifi, per device. An added bonus is that this wireless router also functions as a backup battery that fits in your pocket to keep your mobile devices charge while ashore. It has additional vacation uses too, such as allowing you to share photos & files between devices. Check prices and reviews for the HooToo Wireless Router on Amazon. If the motion of the ocean has you feeling ill, try some natural seasickness remedies. Seasickness medication, while usually effective, will often make you drowsy. So instead of spending your entire cruise in a Dramamine-induced coma, use these natural methods to improve your state of being and enjoy the ride! 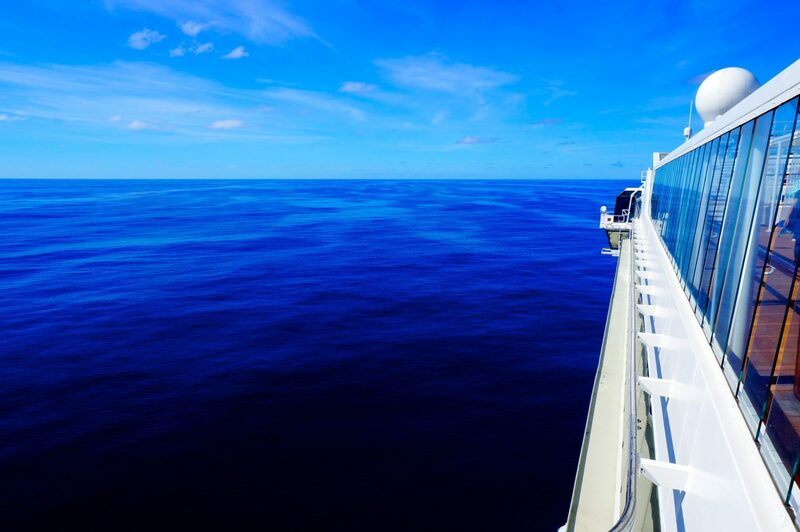 While the well-known tactic of staring at the horizon can be effective, here are other ways to avoid seasickness on a cruise that you may not have known about. 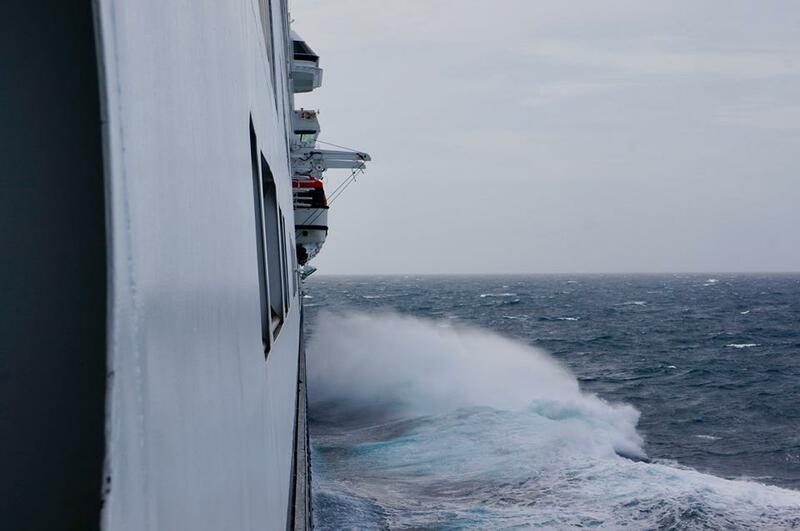 If you’re prone to seasickness, consider booking a lower stateroom, midship. If your cabin is elsewhere, then try to retreat to the most central part of the ship possible. You’ll find the motion is much more subdued on the lower, central areas of the ship. Keep the air on iced-cold which will further help counteract motion sickness. We once sailed through the remnants of a hurricane in 20-foot seas when crossing the Atlantic. Nearly everyone on the ship, including the crew, were plagued by seasickness. Yet we had a cool, lower midship cabin and felt just fine! An unconventional place to retreat to is actually the ship’s pool! Here you’ll get a double-whammy of help. First, the pool water itself will feel refreshing and cool. Secondly, you’ll move with the water in the pool rather than with the ship, which often helps with the disagreement your inner ear is having, causing the sea-sickness in the first place! Just don’t go to the pool if you’re ready to blow. Your fellow pool-goers certainly won’t appreciate that. We recommend green apples and saltine crackers as natural seasickness remedies that are totally free on a cruise ship. All the crew members strongly advocate these tried-and-trusted natural remedies. 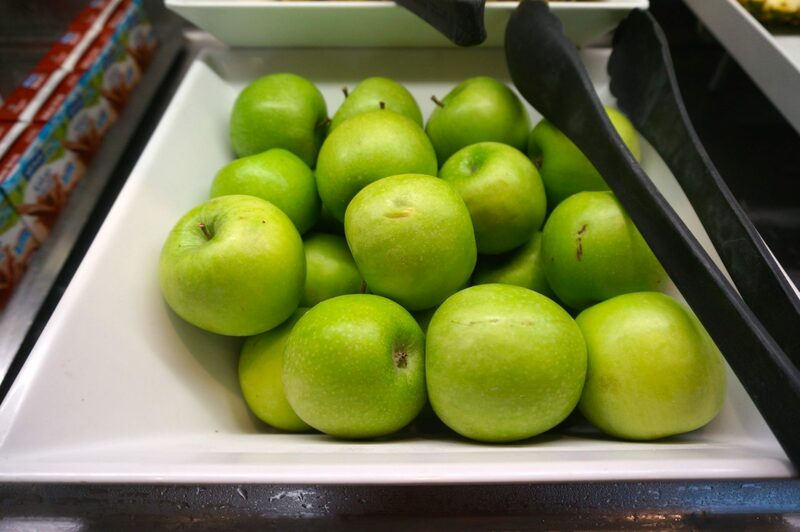 You may even notice cruises more prominently offering green apples and saltines during any particularly rough days. Also, try ginger pills or buy a can of ginger ale as a tried-and-true natural remedy. Did you forget to pack medicine or didn’t expect to get seasick? All ships sell seasickness medication at the gift shops. But instead, ask Guest Services, the clinic, or even your stateroom attendant for some seasickness medication and they’ll provide it free of charge. Even though it’s sold in the cruise gift shops at outrageous prices, all cruises will actually provide some sort of seasickness medicine entirely gratis. Just ask. We have received ginger pills on some lines. Other times, ships have provided Meclizine Hydrochloride (generic Bonine). But we recommend bringing ginger pills on board with you to use as a natural remedy. They’re also super cheap online, so order a bottle on Amazon before you depart and there will be no need to approach the customer service desk with a green face. When booking a cruise, most cruise lines or agencies will offer you something called “trip insurance” or “travel insurance.” It’s very important to have travel insurance on a cruise, but NEVER book travel insurance with the cruise line directly. The cruise hack is to book with a third party travel insurance agency instead. First, why do you even need travel insurance for a cruise? There are endless reasons to protect yourself, but here’s just a sampling of why you need travel insurance: trip cancelation, medical coverage on a cruise, lost baggage, flight delays, etc. If you get sick during the voyage and need treatment, you’ll be stuck with an extremely expensive medical bill when visiting the ship’s doctor. But travel insurance covers such exorbitant expenses, should they arise. If your flight is delayed to your cruise port causing you to miss the ship, travel insurance would fly you to the ship’s first port or could cover the costs of the having to cancel your cruise. If you got sick before the cruise or something unfathomable like a death in the family prevents you from going, travel insurance would cover all or a portion of your otherwise non-refundable cancelation. Why not to book trip insurance with the cruise line: Policies from cruise lines often contain minimal coverage at inflated costs. And we’ve found it to be painstaking to track down specifics of what their coverage includes. Also, these policies often cover only the cruise itself. That means if you’re staying in the port city of embarkation before or after your cruise, you may not be covered during your pre- and post-cruise travels. Furthermore, your flights to the cruise port probably aren’t covered either unless you booked them as part of a package with the cruise. And if for some reason the cruise line financially defaults, the cruise line’s own insurance policy won’t be able to help you out at all. For all of these reasons, it is important to instead book a separate policy with a third party travel insurance company rather than with the cruise line itself. Be careful when booking your cruise: Many cruise lines and booking agencies will try to pull the deceptive tactic of automatically including trip insurance with your cruise package. 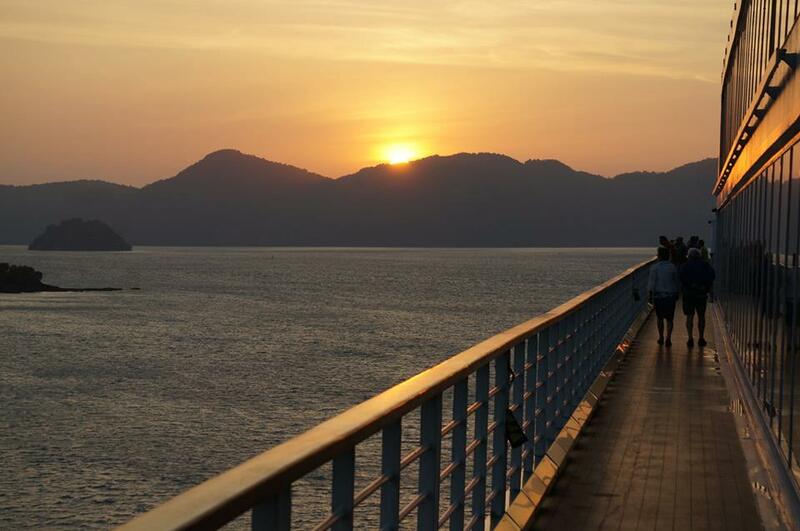 When booking a cruise, be sure to specifically ask that they do not include travel insurance. If they do add this expense to your booking, insist that you’d like it removed. Where to book travel insurance for a cruise: There are many third-party travel insurance companies and we’ve carefully scrutinized all the top ones, comparing the costs and coverage to uncover which ones have the best value. For travels that are less than a month in length and coverage specific to cruising, we’ve found the best value for the coverage offered to be with travel insurance provider RoamRight. Hence we personally use and recommend it for cruise travel. Policy costs will differ based upon the length of cruise and price paid, but you can expect to pay about $50 per person (maybe less) for a weeklong cruise. Simply enter your dates and costs to get a quick trip insurance pricing estimate. (Takes about 1 minute.) This small expense is well worth the peace of mind to protect yourself against unexpected travel mishaps that would potentially ruin your vacation and cost you thousands of dollars. With so much deliciousness out on the open sea, it can often be a happy problem to navigate all of those delectable culinary treats. So here are a few cruise hacks to help you maximize your intake of all those tasty dishes! Can’t decide between the steak and the lobster? Get both! Your waiter will gladly oblige with your request for two main courses if there are two options that both look enticing. This also applies to starters and desserts. Hope you’re hungry! Despite wanting two mouthwatering main courses, you may not have the appetite to eat both. The solution: order one of the mains as an appetizer instead. We find that vegetarian main courses can make for particularly awesome starters, even if you’re not a vegetarian. Sometimes you can even request smaller appetizer-sized portions of main course dishes. Ask and you shall receive! The specialty coffee shops on board cruise ships are revenue centers where passengers can spend money on expensive cappuccinos and lattes. 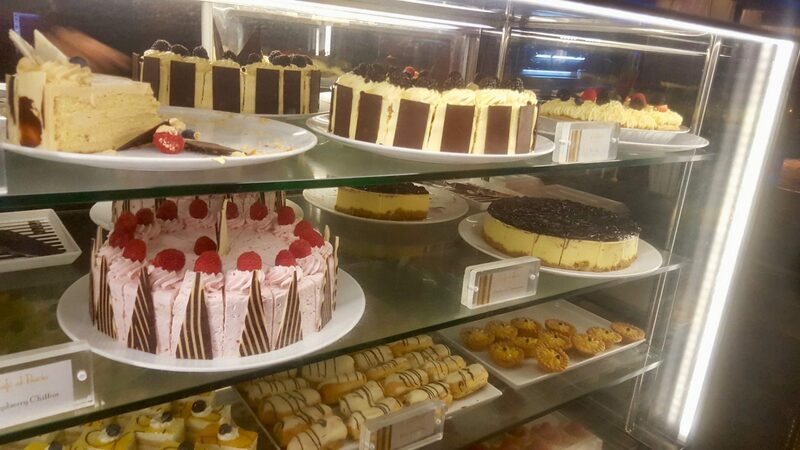 But what many cruise passengers don’t realize is that you can also find beautiful desserts here that are all complimentary. Those wonderful cheesecakes, cookies, and pies won’t cost you a dime. No coffee purchase is required to indulge in them. So if dinner is running long and you need to make it to a show, skip dessert in the main dining room and instead enjoy an alternate sweet treat later at the coffee shop. Room service is often associated with high fees in hotels. Yet unbeknownst to some passengers is that many cruises offer room service complimentary to guests. Free room service is a perk that is starting to disappear from some cruise lines. Yet as of 2019, Princess, Celebrity, Holland America, and Disney all still offer a nice room service menu that is free. Whether you want to order a cheese plate to snack on while you’re getting ready or a full steak dinner from your stateroom balcony, it’s often possible without any fee whatsoever. Those four cruise lines, among others, offer a complete room service menu with items to choose from during breakfast, lunch, dinner, or even a late night snack. So do check to confirm if your cruise does have complimentary room service. Or just look for the menu in your stateroom. Note that Royal Caribbean, Norwegian and now Carnival (as of 2019) do not offer free room service on their cruises. But even those cruise lines still offer some limited breakfast menu items as a complimentary room service option. Have a sweet tooth? Don’t buy that $5 bag of M&Ms in the ship’s duty-free shop. Instead, simply head to the ice cream stand and ask the scooper for a cup of toppings of your choice. We’ve noticed that Celebrity’s ships tend to have a particularly nice range of candy to choose from. You can often get a cup of M&Ms for free, so there’s no need to pay for overpriced candy in the cruise gift shop. Personally, we go for the Sour Patch Kids to chew on by the poolside – yum! 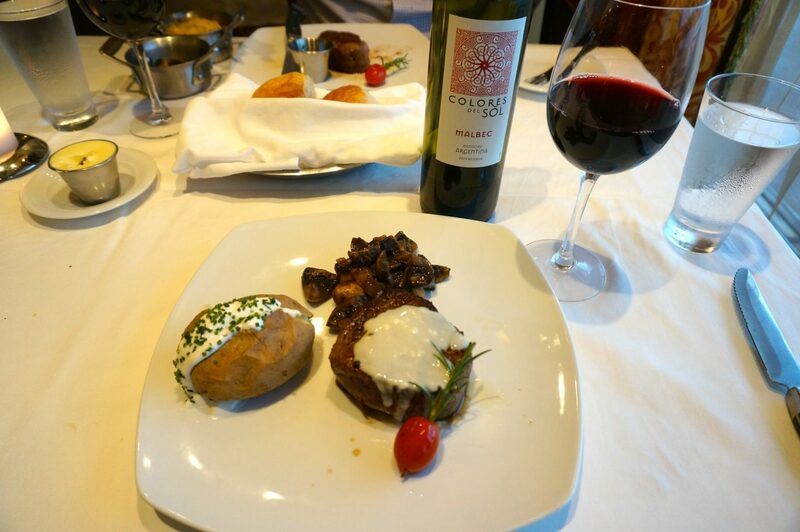 If you want to try out one of the ship’s specialty restaurants, do this on the very first night of your cruise. For whatever reason, everyone always wants to eat in the Main Dining Room on the first night, leaving the specialty restaurants with several open tables. Therefor cruises tend to have special offers on these specialty restaurants during the first night of the cruise. So consider going to the steakhouse on the very first night and you may find such deals like a 50% discount and a free bottle of wine to boot! Check the Day 1 itinerary for such a promotion after embarking or enquire directly at the premium restaurant. If there’s a good offer, go for it! That promotion likely won’t come back again later in the cruise. The specialty dining deals on Day 1 are usually the most generous of every cruise itinerary. Meanwhile, those who choose to go to the specialty restaurant later in the cruise, will not only pay full price, but they may also miss out on a great complimentary meal in the main dining room. Some cruisers like to splurge on a specialty restaurant during formal night. But that is the worst possible time to do so. Always eat in the main dining room on a formal night. 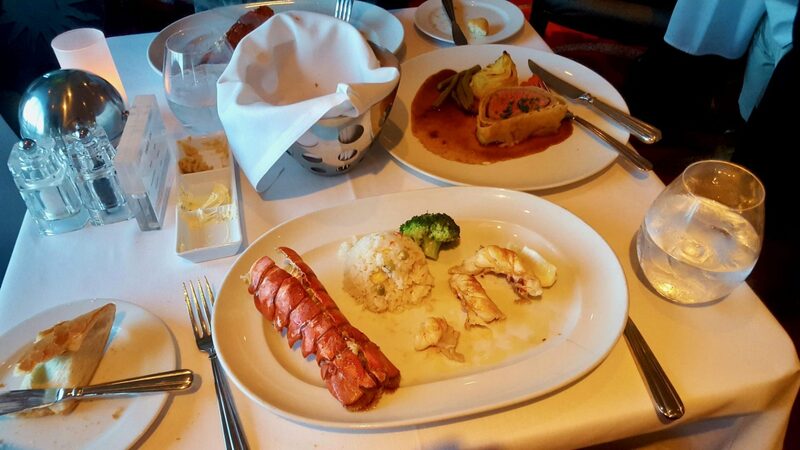 That’s when cruises tend to serve the best dishes in the main dining room, such as lobster and chateaubriand, for example, which is served on Celebrity’s formal nights. 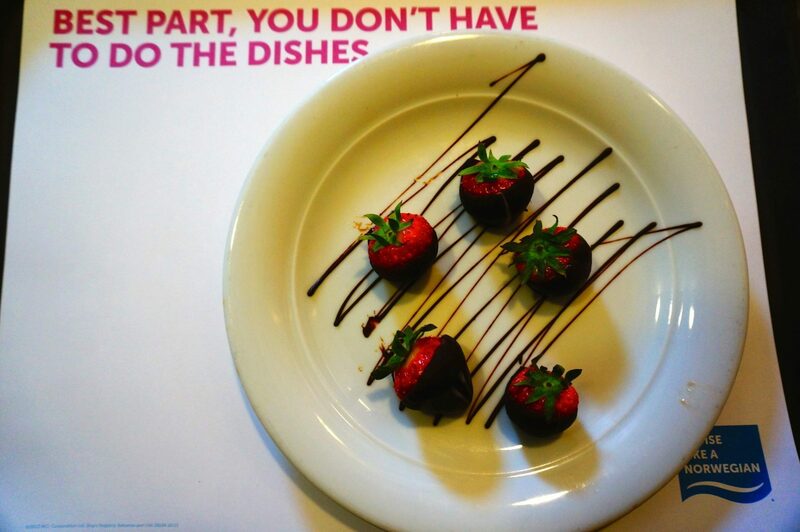 You don’t want to miss these amazing complimentary meals by paying for an alternative at a specialty restaurant! So dine at the specialty restaurant on the first night instead. It is usually a complete cluster at the buffet during lunch on the first day abroad a cruise ship. Everyone has just gotten on the ship, is starving, and the buffet is the most logical place to flock to. But don’t follow this herd mentality once you board the ship! There are usually a few other complimentary dining options available during lunch that most passengers haven’t taken the time to scout out. So there’s no need to wait in a long buffet line to fight for the salad tongs. Instead, start your cruise off right and find out what other complimentary restaurants may be open for lunch. You’ll eat better, avoid the crowds, and have a much more enjoyable beginning to your trip. Again, check your Day 1 itinerary once you embark which will clearly detail what other dining options are open. 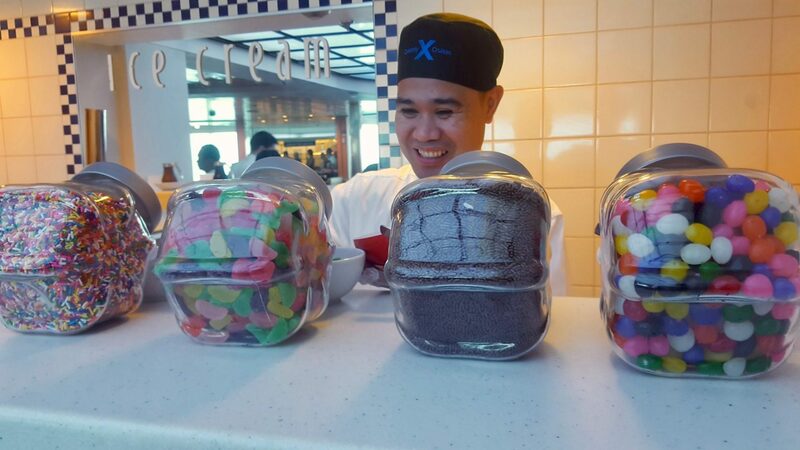 During a recent voyage on the Norwegian Bliss, everyone crowded the buffet. We instead sat right down at the Local Pub, which was virtually empty, as most people just boarding the ship had yet to figure out that this complimentary restaurant served lunch. So while everyone else flocked to the buffet, we enjoyed table service at the pub’s casual and crowd-free setting, with an order of fish & chips and a fantastic rueben sandwich. Drinking on cruises can be notoriously expensive. But it doesn’t have to be. Use these cruise hacks to quench your thirst without breaking the bank! 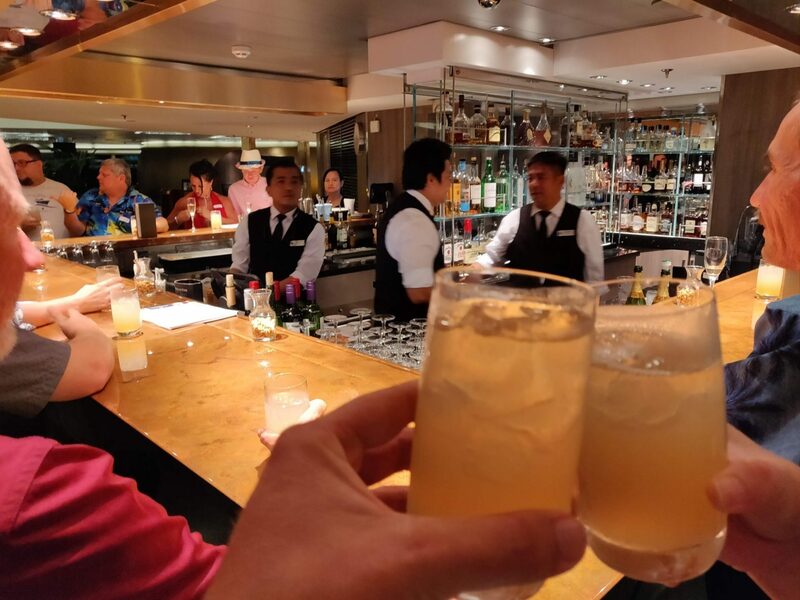 We have so many drink-related cruise hacks to share, so we’ve actually detailed them all in two separate posts detailing all the different ways you can get cheap alcohol on a cruise and even free cruise drinks. And this: 8 Ways to Score Free Drinks on a Cruise. 32) Be Your Own Barista! Use approximately ¾ packet of hot chocolate mix, 2 creamers. Fill cup with coffee. Stir. Instant café mocha! Sure, it may not be quite as good as a barista-made espresso drink. But this simple little cruise hack can save coffee drinkers about $35 over the course of a weeklong cruise, while still jazzing up a boring cuppa joe. Also, tap water is always free onboard cruises and is completely fine to drink. But some people complain about the taste. So bring flavored water drops such as Mio Water Enhancement to turn that water into a flavorful drink. A 4-pack that has enough for 96 uses will cost less than buying 6 sodas on a cruise. So bring some flavored drops to add a little squirt to your water during lunchtime or at the pool. Most cruise lines permit you to bring your own sodas and other non-alcoholic beverages. It seems that most cruise lines aside from Carnival and Norwegian will allow this, but check your specific ship’s policy for bringing beverages aboard to be sure. Then just ask your friendly stateroom attendant to empty out all of those expensive minibar drinks so that you can make use of the fridge. 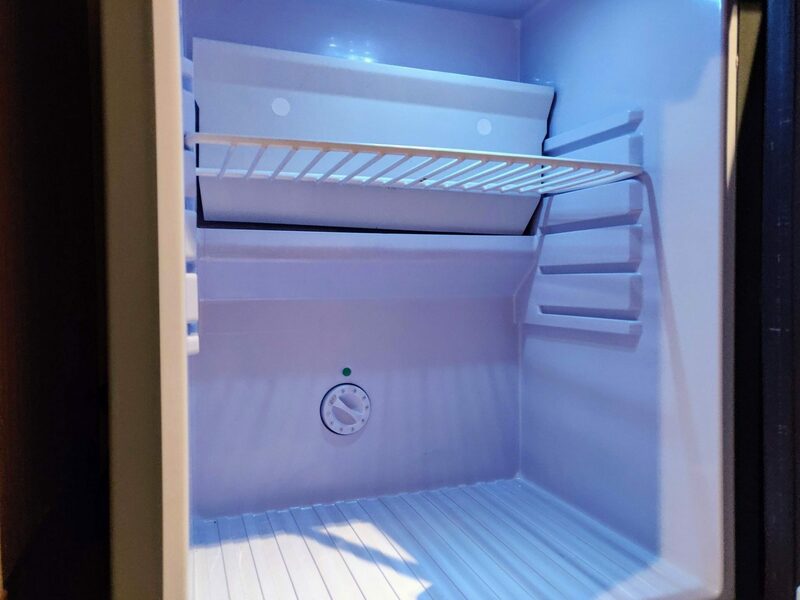 Once the fridge is clear, you’re free to chill down all of the beverages that you’ve brought onboard. And if your cruise cabin isn’t equipped with a mini-fridge, just ask your stateroom attendant for an ice bucket to chill your drinks. Shore excursions can be tricky beasts, particularly if you’re new to cruising and don’t want to pay for the often exorbitant fees charged by the cruise lines. Booking excursions through the cruise line can be very convenient and offers a hassle-free experience, but you’ll pay a hefty premium to do so. These cruise tips should help get you on shore with some spare cash to spend while you’re there. Instead of setting an annoying alarm clock or getting a wake-up call on your stateroom phone, just preschedule complimentary room service breakfast to be delivered to your cabin at whatever time you’d like to be woken up. Instead of a buzzing alarm or a loud phone ring, you’ll wake up to a soft knock on your door and have a cup of coffee in your hand within minutes of waking. 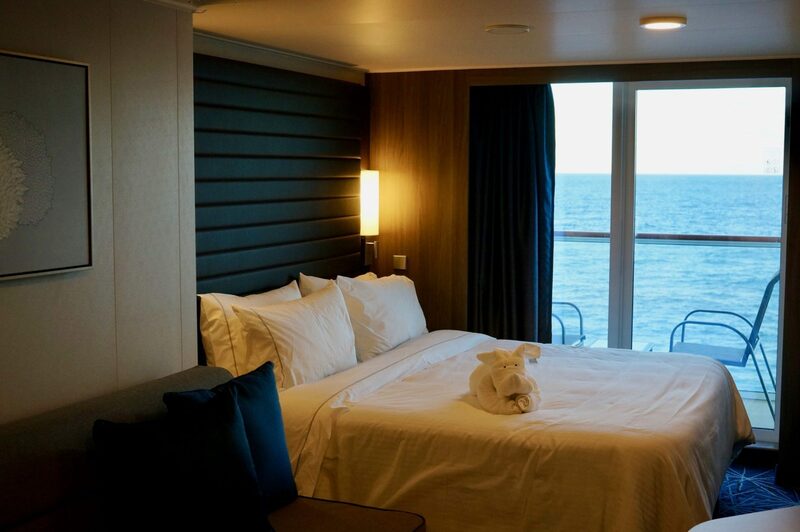 Then enjoy a leisure breakfast-in-bed as you pull into port. If you’d prefer to eat a more proper breakfast, then just schedule a pot of coffee or tea to be delivered to your room. Once you’re done sipping and the caffeine has you moving, head up to the main dining room or buffet for a full breakfast. 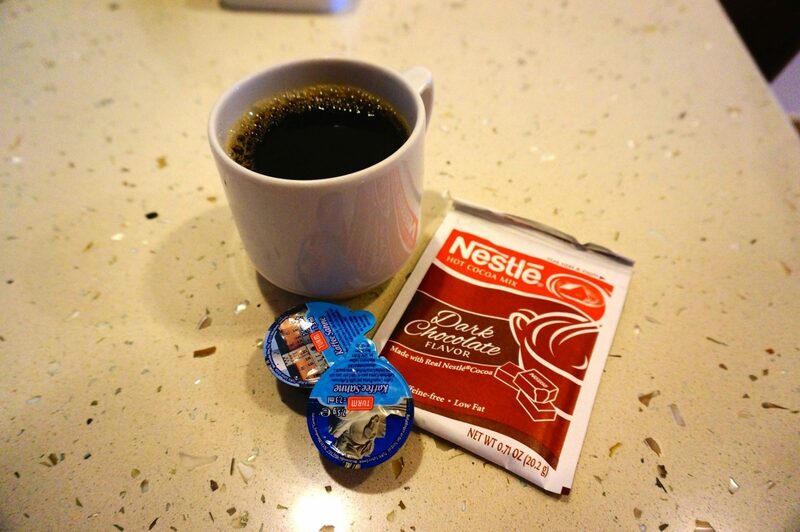 Continental breakfast items and coffee is almost always complimentary on a cruise, even when room service is not. Check your specific ship to be certain. Go out on your own or book excursions directly with local companies operating in the area, which will likely save you hundreds of dollars across multiple ports. Just be absolutely sure that you get back on the ship before the “all-aboard,” because late passengers not on the cruises’ excursion will be left behind. In some ports, do-it-yourself sightseeing can often be accomplished independently. Do some research to see what’s near the port before you arrive. Then just hop off the ship and see the sites on your own. In other places, a rental car can be the way to go. It can be cheaper in some ports to reserve a car in advance, while other times it can be best to just show up at the port. Either way, if you’re a comfortable driver, rental cars can be a very economical option to cover a lot of ground during the short time you have on land. Some agencies have outlets directly at cruise terminals, catering specifically to cruise passengers. Or you can sometimes find people selling tours just as you walk off the ship. Those prices may be negotiable, so don’t be afraid to haggle a bit. You’re not on the cruise ship anymore and in some cultures bargaining is customary. We’ve found the best website to book a good value shore excursion is: Viator.com. They have the lowest prices and tend to have the largest inventory of excursions available in all the popular cruise ports. This makes booking an independent shore excursion so easy. You can quickly browse through and reserve a variety of day tours, which pick you up right from the ship. We’ve found that many of the shore excursions offered on Viator are the same or similar to those offered through the cruise line directly. Yet Viator often has them at a fraction of the cost! We love booking shore excursions through Viator because they have a low price guarantee. This protects you from getting into the port and finding the same excursion at a lower price. Yet we further appreciate that Viator has 24-hour live phone support and their tours are usually fully refundable if canceled at least 24-hours in advance (for those who may be indecisive like us). But best of all, Viator has tours specifically for cruise passengers with dates & times that align with your cruise ships’ itinerary. These Viator shore excursions also include what they call a “Worry-free Shore Excursion” policy, which will ensure your timely return to the port for each activity. In the extremely rare instance (if ever) that some freak occurrence causes you to miss the ship, Viator will actually arrange and pay for transportation to the next port-of-call. Also if your cruise happens to get delayed or diverted arriving to a port altogether, making it impossible to attend a shore excursion you booked, then your money gets automatically refunded in full. All of these assurances give us the confidence to book with Viator. We’ve done this for so many shore excursions now that it has probably saved us hundreds or thousands of dollars, during the past few years of cruising. You can start searching for shore excursions directly from the Viator homepage. Or below are some links to Viator shore excursions for some of the most popular cruise ports. Of course, it’s best to book these excursions as far in advance as possible. Popular excursions do get booked full since many savvy cruisers are now using Viator to book their shore excursions at a discount. So get saving! The port talks are sometimes designed to sell you the ship’s shore excursions, so you may want to skip them in favor of other more fun shipboard activities. But port lectures can sometimes be non-excursion related and very helpful even for those who don’t intend to purchase a shore excursion through the ship. 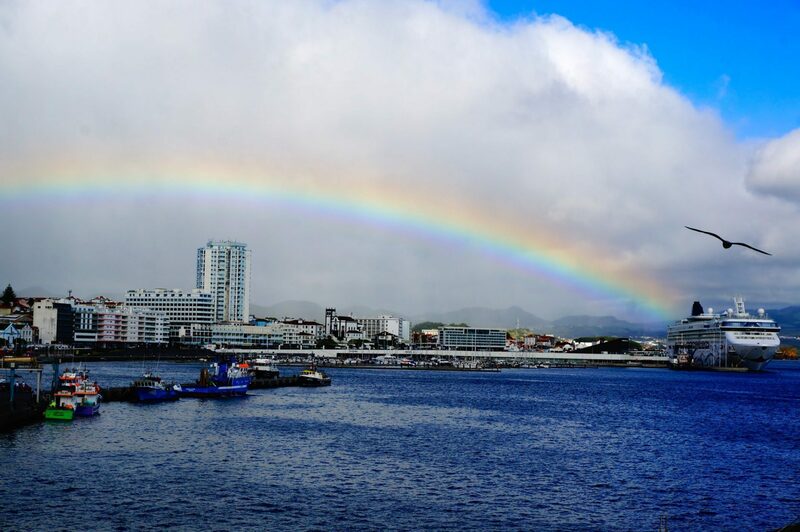 Even if the port talk is based upon all of the excursions the cruise is attempting to sell, the lecturer will still highlight and show pictures of popular things to do in port on these tours. For those comfortable with independent travel, use this info to help decide which sights you may be able to see on your own. Yet these excursion-related talks tend to have further benefits to entice and reward your attendance. Often at the lectures, they give away money-saving coupons to use onshore or other shipboard freebees too. If so, that will be listed in the ship’s daily program. So check it and you may find what they’re giving away something that’s worthwhile to attend. There are some very informative port maps and mini-guides available for every port of call, but for some strange reason these maps are typically not distributed out to all passengers. Sometimes they’re handed out at the port lecture, so you may find them there. But not to worry if you’re unable to get to the lecture. Just ask guest relations for a port map to get the scoop on where everything is once you get off the ship. These maps tend to contain a plethora of helpful information such as sample taxi fares, ATM locations, and wifi hotspots. Be sure to grab one the day before you get into port! These port maps are always available but never pushed out. It’s important to keep hydrated while on shore. Yet in some of the more touristic ports, bottled water can often be outrageously priced. In a scorching hot situation, you may be thirsty enough to pay it. Instead, be prepared and bring a water bottle filled with the ship’s drinkable tap water to bring on land with you. You’ll be saving a few bucks with this environmentally friendly alternative to buying expensive bottled water on shore. Pack a refillable lightweight water bottle like this CamelBack. At nearly every cruise port where there are beaches, you can guarantee that there will be no shortage of vendors offering pricey beach chair rentals and snorkeling gear. Many ports (particularly cruise lines’ private islands) have beautiful reefs that you can swim to from shore. We love snorkeling while in port as a DIY activity ashore. Yet it can be a little gross to think about the dozens of people who put that snorkel in their mouths before you and the sanitary conditions of such island gear. 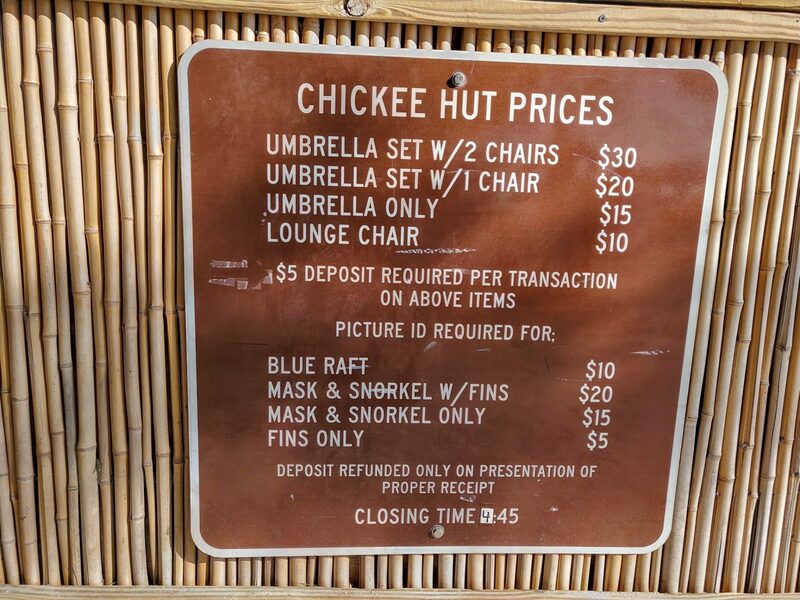 And mask & snorkel rentals are way overpriced. The funny thing is that if you plan in advance, you can buy some nice mask and snorkel sets for about the same cost as renting it once you’re on the island. Often cruises will rent out snorkeling equipment for $15-$30, or even more. This popular Mask & Snorkel Set is a great mask that’s often on sale for the less than it would cost to rent it when you reach the islands. Or consider these full face snorkel masks have become all the rage. Meanwhile at the beach, you’ll certainly want to stay out of the sun and have a place to relax. A pair of beach chairs with umbrella regularly start at $30 and higher throughout most Caribbean ports. For nearly the same price as those one-time rentals, you can buy a pop-up beach shade tent like this to use over and over again. And don’t forget the sunscreen either! We’ve seen astronomical prices for sunscreen throughout the islands and in the cruise ship gift shop, well in excess of $20 for a small bottle. Meanwhile, Amazon has great prices on BananaBoat. So be sure to add a few bottles to your Prime order, to ensure you’re well-stocked before your next cruise. If you have onboard credit and you don’t spend it, you will lose it. You cannot simply go to guest relations and ask for this onboard credit in cash. So don’t ever let your onboard credit go to waste! Instead of blowing your onboard credit on overpriced souvenirs that you didn’t really want to buy anyways, this simple cruise hack will allow you to transform your credit into cash money. Just head over to the casino! Here’s how to turn onboard credit into cash: Insert your cruise card into the slot machine. Add whatever is left of your onboard credit to the slot machine. Although you don’t technically have to gamble at all, consider betting a nickel or so on a slot pull just for fun. (Don’t get carried away though. The slot odds are pretty bad!) Now that your funds are loaded as gambling credits, you can simply cash out those casino funds with the casino purser. You will have just turned your onboard credit into cold hard cash. Jackpot! Be sure to do this while in international waters. If not, the casino will be closed once it nears port, and you will have lost the ability to cash out your onboard credit. 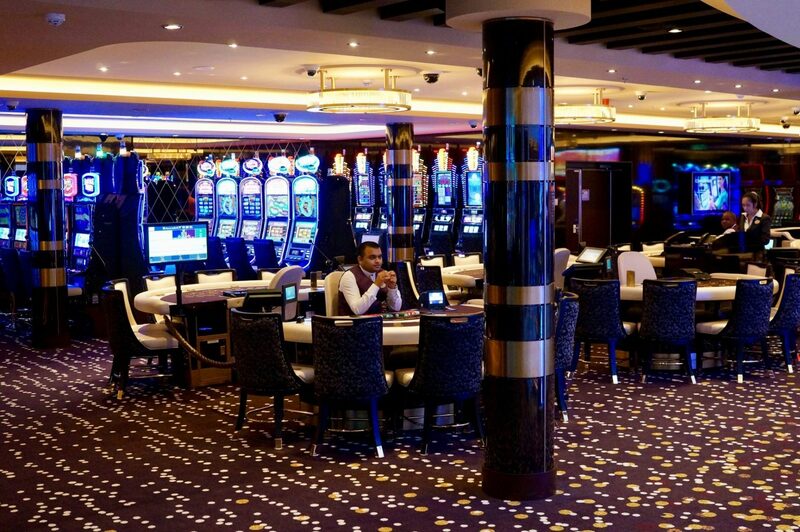 Note for 2019: Although we have successfully used this casino cruise hack many times and on many lines to turn our onboard credit into cash, some cruises are beginning to catch on. During our last Holland America cruise, our onboard credit was marked as not usable in the casino. So just be forewarned that while this can indeed be an effective tactic, it may not always be possible. Cruise ships have notoriously high ATM fees onboard. We’ve seen transactions come with an ATM withdrawl fee as high as $15! So we always recommend bringing cash, should you need it ashore, during or after your cruise. 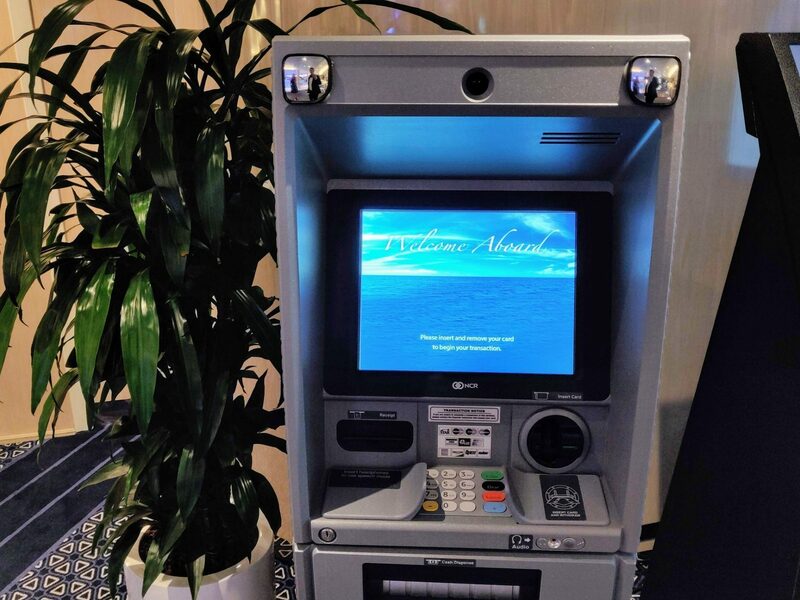 But if you need more cash while on the cruise, you could incur that outrageous ATM fee simply by using the shipboard ATM. Instead, you can use a similar method, as described in the cruise hack above, to get cash from your onboard account. Simply go to the casino and buy chips of casino credit as if you were to use them in the casino. You can use a credit or debit card to do this. It makes no difference. After you buy your chips, don’t actually gamble away your casino credit. Just cash out at the purser’s desk! Some cruise lines will charge a small fee to get casino chips using your card and they may impose a minimum threshold to withdraw. For example, on a recent Norwegian cruise, they charged a $3 fee and there was a $100 withdrawal minimum. Still, the $3 fee is significantly less than the $15 fee that the shipboard ATM would have charged. So there’s absolutely no need to visit the ship’s expensive ATM with this nice little casino loophole to access cash! Just buy some casino credit for a $3 fee and then cash it out immediately. One of the best cruise tips there is, is to simply get to know your ship. Check out the ship’s deck plans before you get onboard and use these hacks to help make the most of the ship itself. If you don’t feel like squeezing into a cramped hot tub with a dozen other strangers, simply go when it rains. You’re getting wet anyway and the pool deck will be completely empty. Unless it’s a really bad storm or lightning is in the area, the pool facilities will remain open and functioning. You’ll also find no lines at the waterslide or at the bar. Enjoy! If booking a balcony stateroom, take a moment to research whether the starboard or port side of the ship will have a more scenic view. Really, it depends on your specific cruise’s itinerary on whether to book a port or starboard cabin. If your ship’s itinerary is going in a closed-loop and visiting mostly mainland ports, book a port (left) side stateroom for a clockwise route. Book a starboard (right) side for a counter-clockwise route. In doing so you’ll be treated to better views when cruising in and out of ports. If your itinerary is taking you in a circle visiting islands, the best views can be a little more uncertain, as it will depend on which side of the island each specific port is on. 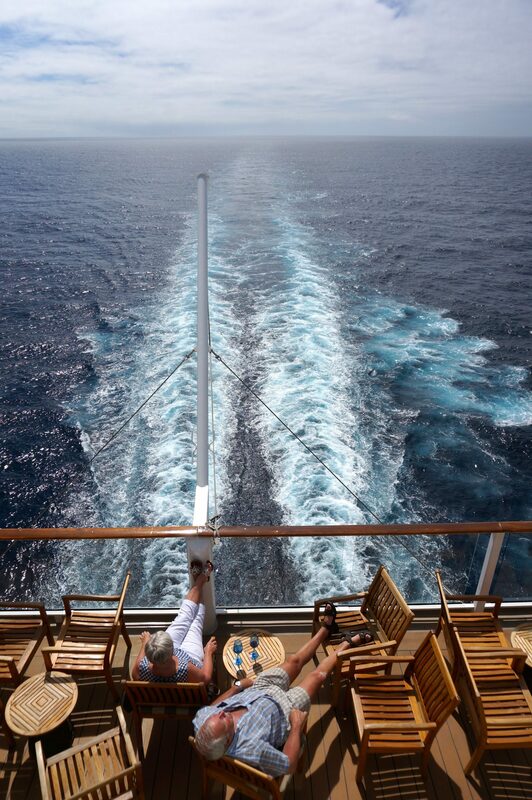 If splurging on a balcony it can be worthwhile to take a closer look at the route map for your cruise itinerary. In doing so, you can determine whether the port or starboard side of the ship will be facing land more frequently, providing you with more scenic views. Most big cruise ships will have at least four entrances to the main theatre (upper starboard, upper port, lower starboard, and lower port). On some ships, one of those theatre entrances may be accessed at a non-thru corridor, meaning there isn’t a hallway extending throughout the length of the ship to the main dining room, where many passengers will be coming from. 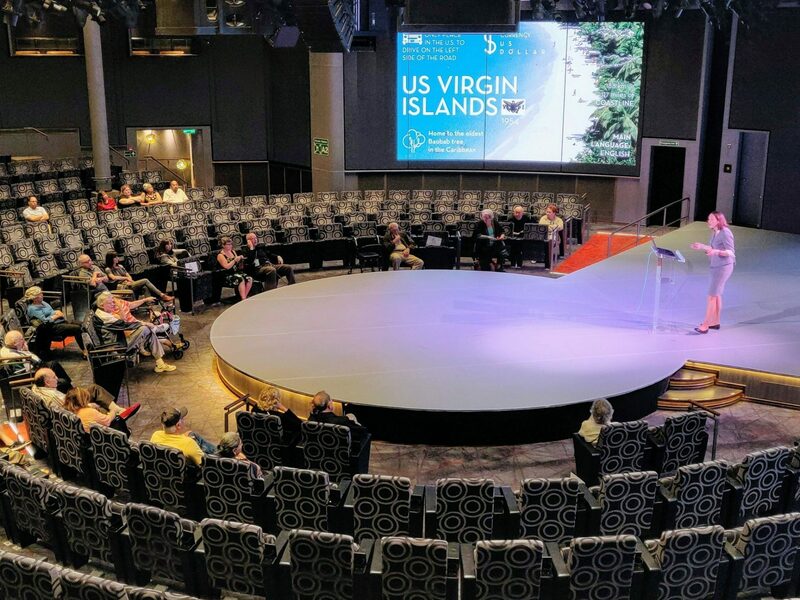 If your specific cruise has a theatre entrance with this configuration, that is the entrance you should always use to get the best seats in the house, particularly if you’re arriving just minutes before the show. You may be surprised to find many empty seats right in the front in this particular corner of the theatre. 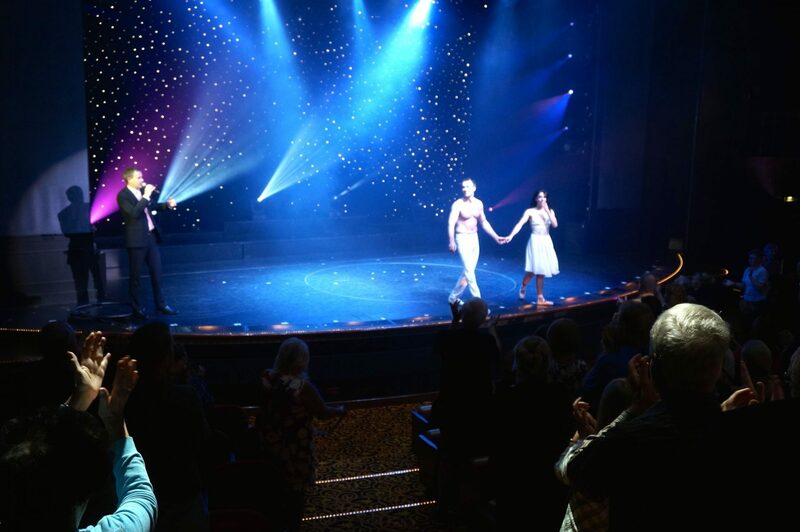 During sailings on the Norwegian Star and the Holland American Volendam, the non-thru lower port-side theatre entrance was a sure bet every single time! While the starboard side was packed full every night, we’d easily slip into a front-row seat within minutes of the start of the show. When a ship is filled to capacity, sometimes you may just want to escape the crowds and have a nice place to retreat to for some serenity. Yet with a finite amount of public passenger space, this can often be challenging. But if you thoroughly explore all the out-of-the-way ship locations, you can be rewarded with your private area of zen. We suggest having a stroll all around the ship on embarkation day to discover such hidden nooks. On the upper decks, take some time out the day to see what is at the very aft of the ship. Then go all the way forward towards the bow. Since all the action tends to center on the middle of the ship, the aft and bow tend to be two very overlooked places to relax onboard. They also tend to come with excellent views! 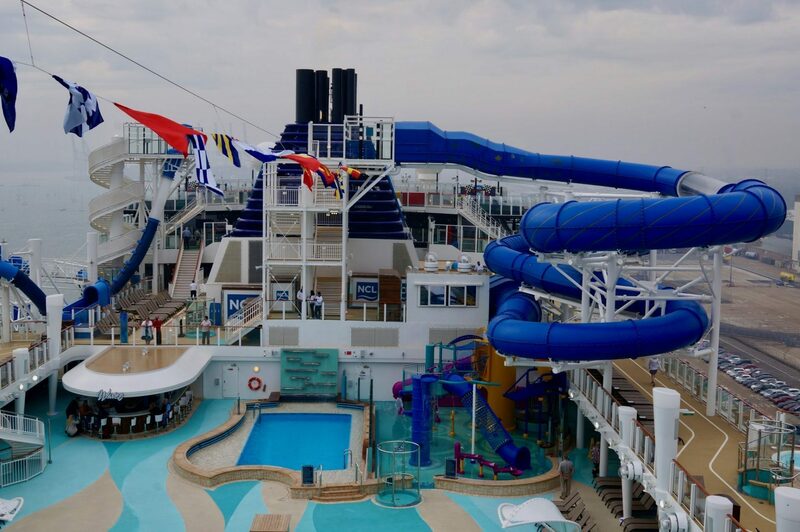 Try this: On the main pool deck (lido deck) go to both ends of the ship, then check both up and down a few decks deck. You may have just found your secret tranquil oasis to escape the crowds! Even if you aren’t planning to splurge on that massage, don’t be a stranger to the spa, which may also have some minimal complimentary facilities. If nothing else, the spa can provide an alternative place to shower. 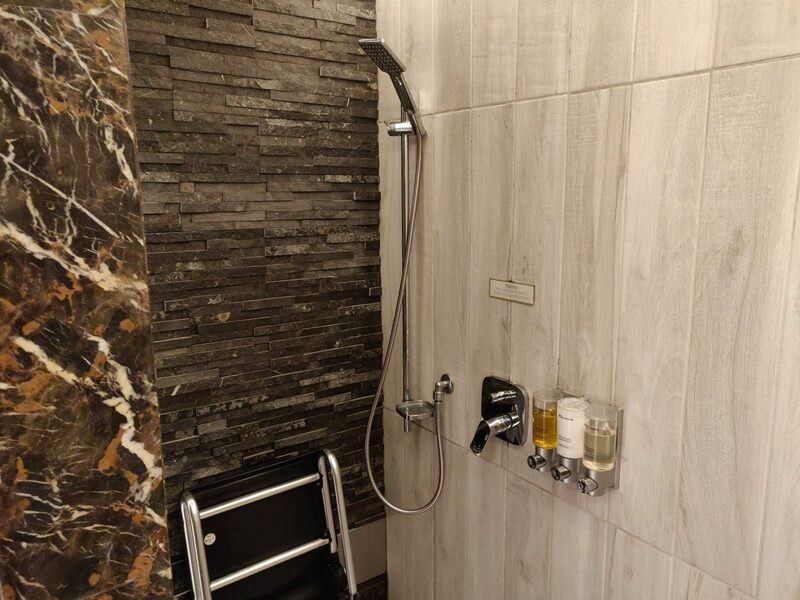 So if there are two people in the same cabin who need to get ready quickly for formal night, the spa’s shower facilities can allow for someone to shower up there. You’ll find towels, hairdryers, and everything. Also, some cruise spa showers are known to have some nice complimentary soaps and shampoos available too! So if you have a spouse that takes ages getting ready in the bathroom, take it upon yourself to use the spa’s shower facilities for free. Did you know that your cabin’s walls are actually made of metal? They are! So before boarding your cruise, grab your favorite magnets from your fridge at home. Or, better yet, buy these cool heavy-duty magnet hooks which hold up to 22 pounds and will really help to avoid clutter in your small cabin! You can repurpose the magnets onboard the ship to keep track of daily guides, receipts, and other pieces of paper that may otherwise start cluttering up your room. It’s a great way to stay organized and create additional storage space. You can also have fun with magnets on the exterior of your cabin by decorating your door or leaving notes for fellow cruisers to let them know your whereabouts. We see lots of people having fun with these magnets on the exterior of their staterooms. Hanging something on the outside of the door makes for an easy way to identify your room. 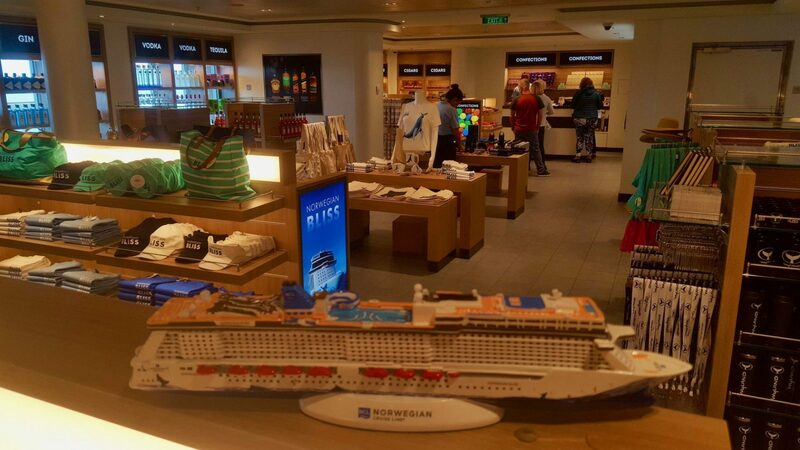 If you’re planning to do any onboard shopping, consider waiting ’til the last full day of the cruise. Often the ship will have a big sale on the last day of a cruise. There will be greater odds of this happening and better deals if you happen to be on a repositioning cruise or if the ship you’re on is about to change itineraries. Check the daily program on the final full day of your cruise to see if there will be a big sale. Towards the last day of a cruise we regularly see sales in which all items in a certain store are priced at $10 or $5 and below. Also, if you purchase alcohol from the duty-free store on the afternoon or evening on the last day of a cruise, they’ll usually allow you to bring the bottle back to your cabin. If bought any other day, it’s held until the end of the cruise. Waterproof Your Phone – If you don’t have a waterproof phone, you’ll want to make sure that your phone doesn’t become victim to pool splashes or ocean sprays. You also may not be comfortable leaving your phone unattended on a lounge chair. So with this Phone Dry Pouch, you can bring it in the pool with you and even dunk it in the water or with you snorkeling ashore! It’s also a convenient place to keep your cruise keycard. It’s usually priced under $10 too, so it’s a great buy. Check colors available and prices here. Bottle of wine – Most cruise lines (not Norwegian, but most all others) allow you to bring aboard 1 bottle of wine per person. Be sure to take advantage of that. You must pack it in your carryon luggage and you must open it in your stateroom to avoid a corkage fee in the dining room. Use an over-the-door organizer for the bathroom – It seems there’s never enough space in cruise cabin bathrooms. We love this skinny and compact travel organizer that conveniently hangs from the back of the bathroom door to hold everything we need. Binoculars – If you’re going to be cruising around scenic coastal stretches, like Alaska’s Inside Passage (See: Glacier Bay Photo Essay), then don’t forget a pair of binoculars. Big cruise ships can’t get too close to shore, so if you want to see towns, glaciers, or have a closer look at a wayward whale – be sure pack a pair. These Bushnell Falcon binoculars are great quality and the price is pretty incredible. Check prices and recent reviews. 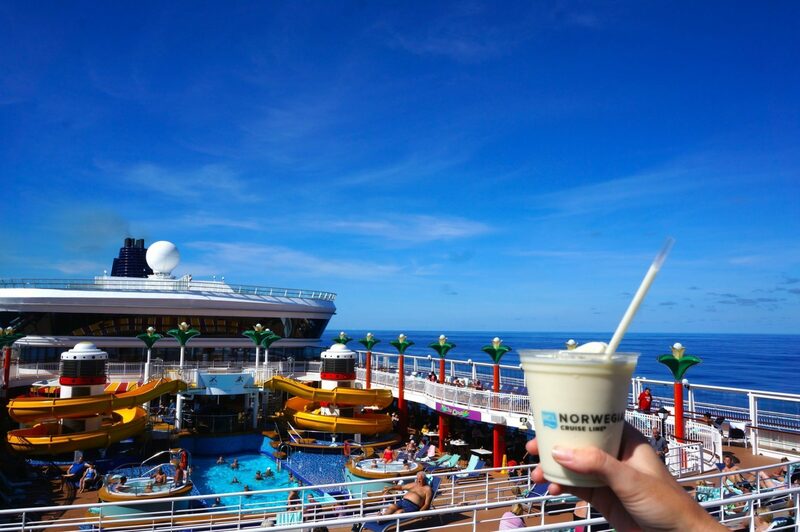 BYO Collapsible Travel Straw – Did you know that most cruise ships now only include straws in drinks by request and are planning to ban straws entirely during 2019? The straw-free movement is an environmentally friendly initiative currently sweeping the world. So pack these reusable travel straw so that you’ll be able to sip your piña colada the way it was intended, yet without that harmful plastic. 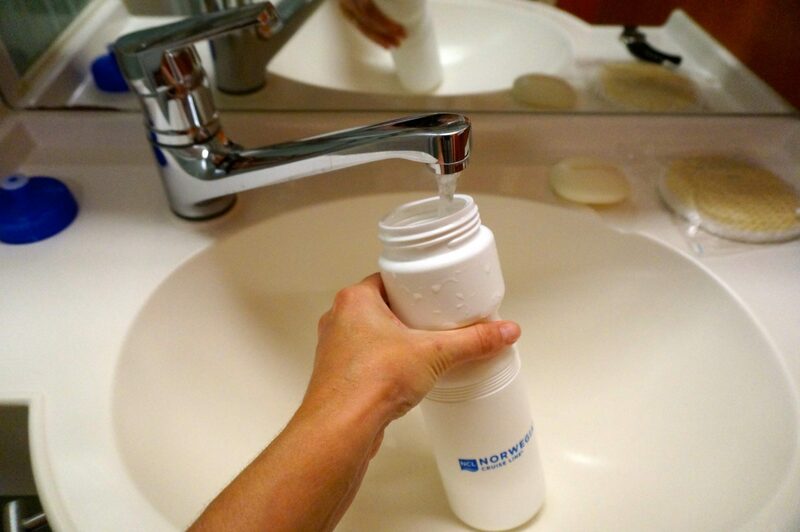 Water bottle – Stay hydrated on shore excursions without buying expensive bottled water. Pack a refillable lightweight water bottle like this CamelBack. Sunscreen – Of course you want to protect your skin. But if you use all of your sunscreen and need to buy more on the ship, expect to pay upwards of $20 for a small tube in the ship’s overpriced gift shop. Instead, stock up before you go. Amazon has great prices on BananaBoat. Mask & Snorkel – Don’t pay the inflated prices to rent a nasty used snorkel. Buy one in advance, instead. This popular traditional Mask & Snorkel Set is a great mask that’s often on sale for the less than it would cost to rent it when you reach the islands. Or consider these full face snorkel masks that people rave about. Pop-up Beach Tent – If you’re taking a beach-heavy cruise like a Caribbean itinerary, this compact foldable pop-up beach shade tent can be a great accessory to bring with you. Seasickness Prevention – If you don’t have your sea legs, come prepared with a plan. We find Bonine works well and has less drowsiness effect than the popular Dramamine. Alternatively, go natural and try ginger pills, which tend to calm nausea associated with seasickness without any side effects. Stay organized with magnets – Yeah, we just mentioned this in cruise tip #49, but it’s such a fun item to bring aboard. Plus these magnet hooks are inexpensive, so it’s worth repeating here in this cruise pack list. Travel scale – If you’re flying home after a cruise, this tactic will help to ensure that you’ll be under the weight restrictions imposed by airlines. We use a little travel luggage scale to keep tabs on our bags’ weight. Backup Battery – If you’re going to be out on all day shore excursions and have a mobile phone or camera that won’t hold a charge with all the pictures you’ll be taking, then be sure to pack a backup battery. We personally use (and love) this Anker PowerCore Backup Battery that is very lightweight, yet will recharge your cell phone many times over. Speaking of packing… After constantly traveling around the world for the past five years on cruise ships and other forms of transportation, we’ve finally developed the perfect packing list. We have meticulously detailed all of our travel gear recommendations. 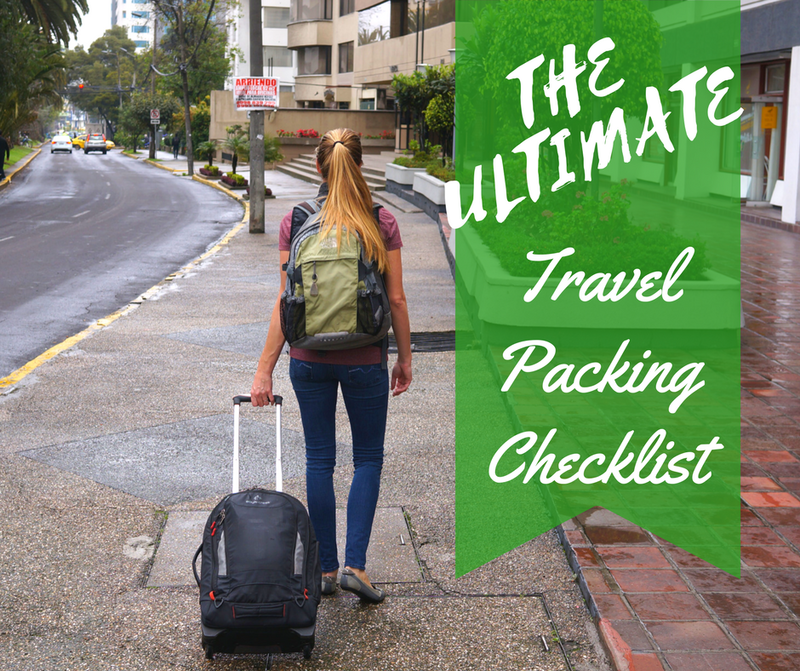 So for a more all-encompassing pack list, see our big Ultimate Travel Packing Checklist & Tips to ensure you don’t forget to pack anything important for your next trip. We hope these cruise hacks have been helpful and that you’re now all ready to set sail! Wait, don’t leave us just yet. If you liked these cruise hacks, let’s stay connected! We actually just completed cruising entirely around the world without using a single flight. We accomplished this ultimate world cruise using 4 different ships and on a super low budget around $60 per day! We basically spent the past year living on cruise ships now and it actually cost us less than our former working lives back on land. Check out this video we made of all the highlights. Also, stay connected with our travel blog if you’d like to receive more travel tips and inspiration. The best place to continue receiving updates from us is over on Facebook. So be sure to follow Roaming Around The World on Facebook to see where in the world we are today and receive updates about future blog posts. We also use Facebook to post daily travel tips or travel inspiration from wherever in the world we’re currently roaming. See our latest post below, for example. Lastly, with so many cruise tips in this post to remember, be sure to bookmark this page or “pin” the image to the right to your Pinterest boards to save for later. Publishing note: This Cruise Hacks post was initially written in 2015 and is continually updated, most recently in January 2019 after our latest cruise. We have been on many cruises and developed some of these same hacks over the years. I so much appreciate having them all in one place and more than we came up with! We are going on a family reunion cruise and I will definitely share this with them. I also have a travel group that follows me, and so I will share with them, hoping they will also follow you. The only thing I can add has to do with how we pack. You know those plastic covers that pillowcases, sheets and blankets come in? They make excellent packing cases for travel. Some have zippers. I pack like things in a case, then pull out the case and throw it into a drawer when we arrive on the ship. Also, cruise ships usually offer discounts on laundry. With two of us in the room, we each get a discount bag and send our laundry down twice during the cruise. That way we pack less. Consider the cost of an extra bag is usually 25+ on an airline. With the discount, cruise laundry is usually $20 a bag, and we can really stuff that bag. Of course you can always do your own laundry on most ships. Cruising makes it easy to visit several places in a single trip without the need to repack your belongings and sit in a car/train/bus/plane to travel to each one; your hotel room comes along with you, and even provides the transportation. This will surely save lots of money during the trip. Room service on Royal Caribbean now has a $7.95 charge…..unless it’s continental breakfast (a hot breakfast will cost you though). Thank you for pointing that out. 🙂 I’ve just updated the post to reflect that. You have smartly covered every single topic and your tips are awesome. Thank you for these real money saving tips. Great tips & Hacks! I will defitnitely check out the resources to use on my upcoming crusie! Just wanted to reiterate on the “Cruise Checklist” for bottled wine. I have cruised several times on Carnival and each time I carried aboard one bottle of wine (per adult), water, and sodas. Regarding travel insurance, you should check your credit cards to see if they include insurance as part of their benefits. Most credit cards targeted to travelers include coverage for trip cancellation, interruption, lost luggage, etc., and it’s included in the card’s annual fee. If you’re a Costco member, their card is free and includes $3,000 of coverage per traveler, with no limit on the number of travelers. Others, like Chase and AMEX travel cards (United, Sapphire, etc.) cover up to $10,000 (and some up to $20,000) for two people with some restriction on the relationship of the travelers. The only requirement is that you pay for the travel with the credit card. We took a particularly expensive Galapagos cruise last year and we paid for it using three different cards so that, in aggregate, we were able to cover the full cost of the vacation without spending an extra dime for coverage. Each card will reimburse however much you’ve paid on it, and it’s totally legit. We have had to make only one claim in the last 10 years, and it was virtually no-question-asked, just provide proof (a doctor’s note, cancellation notice, death notice, or the like), and the receipts for the expenses, and the insurance is paid as promised. I highly recommend this approach as travel insurance is a money-making scam for the travel industry. Not to say it isn’t good or necessary, only that it’s overpriced, rarely used, and is a big commission maker for agents, who will almost never tell you to consider whether you already have insurance via your credit cards. I know, because I’m a part-time agent and see how the agencies push the insurance. I always tell my clients to check their cardsl–it’s one of the biggest money-savers you can use to reduce the cost of your cruise. If you don’t have a travel-based credit card, go get one. The small annual fee–usually about $95 to $150–gets recovered on the first cruise you take without having to pay for the supplemental insurance. You also earn points toward travel, so the cards are a double win! I can only partially agree with this. Yes, a good travel credit card that includes travel coverage can be very beneficial, such as trip cancelation and lost luggage benefits that many do include. But, first of all, not everyone has a good travel credit that includes this coverage. We do, but we still ALWAYS take out a travel insurance policy and recommend. Why? Because credit card’s travel coverage does not include any overseas medical coverage, travel accidents, assaults, theft, natural disasters, emergency evacuation, and other cruise-specific coverage. If you need to see a doctor on a cruise, you’re looking nearly $200 just for a simple, quick check-up, let alone something more serious which could run into thousands of dollars. Your credit card coverage isn’t going to reimburse you for that, but travel insurance most certainly will. The trip cancelation and luggage coverage that many popular credit cards have is a great benefit to consider using when booking a cruise that we’d likewise recommend. But we prefer to have more than just our cruise cost and baggage covered, to ensure our health & safety is insured, which no credit card coverage includes to our knowledge. If we have a medical emergency out in the middle of the ocean, we’re relieved to know that our travel insurance will help us out. I have not read through everything and I am loveing it all so far so thank you! I was just reading about the messaging service instead of a walkie talkie and I was wondering if you have heard of the Voxer App which turns your cell phone into a walkie talkie then you don’t have to pay for the service. I use it for my small business and communicate with everyone in the US. They have another app for international messaging that does the same. They are Free!! Yes, have heard of Voxer but it wouldn’t really work well on a cruise ship. Push-To-Talk apps like Voxer are free to use but require a data or wifi signal in order to send and receive messages. So it would work on a cruise only if you purchased an unlimited wifi package for each phone, which would end up being a very costly way to use the app, given how expensive wifi plans our on most cruises. The ships’ own messaging apps would likely be a much more inexpensive messaging solution. I’ve been wanting to have a vacation on a cruise ships and this is probably the best cruise tips i’ve read so far. This is really helpful. So glad to hear this post has proved helpful to your future cruising! What a great find! We are taking our first 2 week cruise out of Amsterdam through the Baltics. I found some great ideas on here. I have a hint about cabin space, specifically bathroom storage space. Two cruises ago, I purchased a 12 mesh pocket over the door , (shoe) storage hanger from Amazon (MISSLO Heavy Duty Over the door Storage with 12 Mesh Pockets (White)) . There are 3 sizes available. When my husband and I get into our cabin, we unpack immediately and store our luggage under the bed. Then we unpack our toiletry kits. I use one side (6 pockets) of the mesh pocket hanger and he uses the other 6 pockets (he even stores some of his electronics in these pockets). We leave this on the inside of the bathroom door and it saves space on the small countertops. It comes with 2 removable hooks that fit over the top of the door. If it doesn’t fit, you can hang it by 2 strong magnets. We have used this on 2 cruises and also in hotel rooms when we are going to be there for more than a few days. My husband loves it! No more packing and unpacking toiletries, make-up etc. and the bathroom stays uncluttered. Thank you for all the work you did into putting this list together. We found it very helpful. Love your around the world cruise plan…have fun. Oh yes, we love those mesh hangers and travel with one ourselves. Although we’re not quite as organized with a his-&-hers section, but love that idea and we may have to now implement that! You’ve also just given me the idea of adding a hanging organizer to our section of packing suggestions for the next time we update this article. Thank you! Will have to look into the Misslo one you mention – it sounds perfect! Hope you have a wonderful Baltics cruise ahead – bon voyage! Like most people, we are cruising more and finding out the benefits of cruising compared to conventional holidays. And we are loving it. Thanks for your additional tips and guidance. Really helps us. Several of the suggested packing lists I have seen mention packing a pressure extension rod. What use with this have on a cruise ship? Thank you! That’s a new one for me and had to Google it myself. I read that some cruisers pack a tension rod to have extra space to hang clothes in the small closets of their cabins. I can also see it coming in handy to put in the shower to hang wet clothes. Thanks for the tip! Such a nice blog i have come across. great article with some amazing images. Cheers!! Thanks for the kind words Manish, much appreciated! These are some really GREAT Tips! We have cruised several times and have discovered several of them on our own, but learned many new ones! An unusual question. We have been beginning to talk about going on a “Bucket List” retirement World Cruise, but our research so far has shown that the typical daily costs per person are MUCH higher than for other cruises. Do you have any thoughts or tips regarding these long cruises?? When we cruise, it is always more economical to find a local when at port and book a cruise with them. The prices are always way less expensive than going directly thru the cruise line. We visited Roatan and saved over 70% by using local tours. Common sense goes a long way when wandering around in another country. Just be respectful and mindful of your surroundings and have fun. We completely agree with that. In fact, the last time we docked in Roatan we simply rented a car and drove all the way from the cruise port to Camps Bay. It was a great experience! Am so glad you found these cruise tips to be helpful and we hope you had a great cruise to the Yucatan! Yes, it’s important to weigh out whether the drink packages are worth it or not, depending on how much you drink. We also usually find that it’s not worth it for us, but it is nice when we can find a cruise that includes it as a perk! We’ve read about those stories of people living out their retirement on cruises – in some cases, it can be even more affordable than retirement on land! Glad you found the post helpful. Happy cruising! Superb cruise hacks and tips, its very helpful cruise holidays post for the people who travel pr planning their first time cruises holidays. These are great tips! We have been on several cruises but never with our little one. I can’t wait to take him on one, saving these for later! Thanks and we’ve glad you found us and stopped by. Best of luck in your volunteer efforts! This tips are awesome! I am planning to take a cruise soon and I find this very useful. Thanks for sharing this! So glad that you found these tips useful. 🙂 We hope you have an an awesome cruise and these tips help to make your trip even better! Bon voyage! Thanks for the advice on how to arrive at your cruise ship with style. I had never thought of using a taxi or some kind of shuttle to make sure I get there safely and on time. This information would be perfect for anyone who might be stressed about their cruise and maximizing the fun. Thanks for the comment. We firmly believe in maximizing our time at the ports of call! Great blog, really enjoy all of your tips. Question regarding turning credit into cash. You mentioned to do it before you hit US waters. What if our cruise is to Alaska? How does that work? Hey VW, thanks for the comment and question. Your Alaskan cruise route is likely going to be at least 2 miles offshore at periods of time during your sailing. During this time, the ship will be in international waters and the casino will be operational. You’ll then have an opportunity to turn your credit into cash. My husband and I are looking into a cruise for the first time and we can’t seem to come across answers to a lot of our questions. Love this article! Helped us incredibly! Couple more though if you don’t mind. Does it cost any money to just get off the ship during regular stops, and hang out at the beach? I expect to be spending some extra money on tips. I’m sure not only is it expected, but I’m sure the crew relies on it as a part of their income. I would expect the typical 15-20% on dining. What is a typical tip for a free meal? Or room service, and turn down services? Where else am I expect to tip that I’m not thinking of? As for tipping, the cruise will automatically add “gratuities” to your onboard account, which is charged to the card you have on file on the final day. The exact amount varies by ship, but usually it’s somewhere between $10-$15 per person, per night. These gratuities cover your tips for the wait staff and your stateroom attendant (cleaning, turndown service, etc.) It’s not necessary to tip the wait staff on top of the gratuities they receive, but you can certainly adjust the gratuity amount higher or lower, if you desire, based on the service you received. The only other place you would generally tip on the ship is the bar staff and casino staff. They are not covered by the gratuities, so you can tip them directly. Hope that helps and you have a fantastic experience on your first cruise! We’ve taken at least 10 cruises and yet I still found many of these to be very helpful! Thanks! Wow, this is truly amazing. Y’all are so cute together! So happy for your experiences and for going out of your way to share them with us! I have learned A LOT from this blog. Again, thanks! About to read some more! Hi Matthew, thank you so much for the comment and kind words! So glad that you have learned a bit from our travel experiences. Here’s to you and future travels! I loved all the information you have in this post. It has been most helpful as I am preparing myself and my boyfriend for our first cruise for the end of this year. I am an avid planner and all of these tips and tricks are exactly what I have been looking for to get started and are great for my piece of mind. Now I have an idea on where to start as I tackle this huge trip we are taking (it’s only 6 days but in my mind it feels like months). I do have a question, I have traveled from state to state before by airplane but I have never taken a cruise and honestly I am deathly nervous. So nervous I don’t even want to to go, but we are going no matter what and I need some advice on how to turn my nervousness into excitement (at least some of it). I need some help; with it being only months away if I don’t change my view I won’t be able to plan correctly or pack correctly or be able to generally enjoy myself when it comes time to go. 🙁 If you have any sort of ideas or advice I would greatly appreciate it. Thank you very much. Hi there. I had to check your post a few times to make sure I hadn’t written it myself! We went on our first cruise a few years ago. I’m a bit of a deal maven and got super caught up in a terrific deal I’d found. In all of my excitement of booking the steal, I neglected to acknowledge that I was *terrified* at the thought of the cruise! Some of it was logical – worries about seasickness or not being able to get off the boat. And some of it was illogical – dreading open water, falling overboard, etc. As we boarded on our departure day, I was near tears. The enormity of the ship overwhelmed me and I felt like I was stuck doing this thing I didn’t want any part of. Like you I wanted to be excited but was too nervous to think straight. We immediately bought the liquor package (wise) and took our pina coladas to the top of the ship. I was panicked and annoyed with myself and my bf was dutifully trying to calm me. But as the fun music started playing and the boat pulled away with a lot of waving and fanfair, my anxious blubbering quickly turned to giggling and clicking glasses. The truth is, the ship is truly akin to a floating Vegas hotel. It feels very safe and the extra traveler insurance I purchased made me feel that we’d be set in case of an emergency. Knowing wifi is avail (if expensive) helps you feel connectivity is possible. And, truthfully, the vibe was so fun and the activities so numerous, we were constantly occupied. I scoured the internet for someone who might say the right thing to calm me. You’ve probably come and gone on your cruise by now, but if there’s another fearful adventurer, hopefully this aids in alleviating some of that extra anxiety. I even contacted a friend who had been aboard that Carnival ship that got stuck without power for several days. She said she’d have no qualms about returning in a heartbeat, even with that mess. It truly is fun and relaxing…even a bit silly. We had a blast and surprised ourselves. Great tips – going on our 2nd cruise, this time with Carnival, in February. I am “amending” my list of items to take, because of some of your suggestions. Hey Carrie, thanks for the comment! So glad you found our suggestions to be helpful. Enjoy your cruise! I am actually pleased to glance at this webpage posts which carries tons of helpful data, thanks for providing these data. Thanks so much for the comment, we’re thrilled that you found our Cruise Hacks to be helpful! Going on our first cruise in January. These tips have been very helpful. One question: Can onboard credit be used for gratuities? Thanks. Hey AJ! Thanks for the comment, so happy you found our tips to be helpful. Yes, most of the time you can apply on board credit toward gratuities. However, this my vary by cruise line and the type of credit you’ve received. We’d recommend calling your cruise lines to confirm. Enjoy your first cruise! These are great tips! I especially enjoyed the wifi section. I just returned home from a cruise and I was happy to see some push notifications come through. I totally agree about checking out the hot tub during the rain – it’s the only time we got to enjoy the hot tub kid-free. On the first few nights of a cruise, I find it helpful to deploy a thin glowstick on the step-up to the bathroom. It’s easy to stub a toe in the dark until you get used to it. That’s a great tip – thanks for adding! 🙂 Not only is it great to not stub you toe but also I hate turning on the bright bathroom lights in the middle of the night because it always wakes me up and is hard to go back to sleep. Your glowstick idea definitely solves that. Will have to give it a try next time. Thanks! There’s no need to turn on those BRIGHT bathroom lights in the middle of the night if you bring along a couple of cheap battery operated votive lights. We attach super strong neodymium magnets to them. Also a great idea and another perfect use for those super strong magnets! Hey Janet! Thanks for the kind words! As far as the wifi, we wouldn’t recommend streaming movies on the laptop, as that will quickly us up whatever minutes you purchased. Also, the bandwidth may not be strong enough to stream movies, but Royal Caribbean has recently upgraded their wifi, so maybe it will be. Any other wifi usage on your laptop should work just fine. As for the phone, I’d need to know your AT&T package to comment, but you can connect your mobile device to the ships wifi too. Be sure also to check your AT&T package to understand your exact coverage to avoid costly roaming charges. Have a fantastic cruise! Cool tips! One of my most effective hassle-free and money-saving must-haves during travels is a pair of two-way radio. i use this when with a friend or loved one so we can communicate more easily when we’re apart. Hi! Thanks for the comment! The two-way radio is an excellent idea, thanks so much for sharing! I have wondered bow well two way radios work on the ships through all the walls and nooks and crannies. Have you had good success with communicating by walkie talkie? We’ve never personally used walkie talkies, so can’t comment from firsthand experience. However, we do see fellow cruisers using them on occasion. I think most people use the cruise line’s app (where available) to stay connected. Thank you so much for sharing these Wow tips! I will be sharing them with friends and family! Hi Mike! Thanks so much for the comment and sharing! Hi! Thanks so much for the comment. So happy you found the tips to be helpful! One thing that I noticed last cruise was that when people arrived back to the ship after a day at port, they would bypass the liquor check-in by placing one alcohol bottle in their backpack/purse and checking in a different set of bottles being able to take the unchecked bottle to the room. There are some vendors that deliver the liquor to ship after purchase but there are still a few vendors that leave that task to the customer. I still think that it is easier just to buy the beverage package and not have to worry about it and fully enjoy my vacation. This is well thought out, well organized and extremely valuable information. We’re going on our 5th cruise in August and I’m still very interested in “hacks” or any kind of tip that might enhance my trip. Thank you so much for sharing this information. I too, am a firm believer in treating crew members with the utmost respect and dignity and I often tell them on the first night not to worry so much about our cabin. Thanks Julie! There seems to be so many cruising hacks out there so this was our attempt at gathering some of our favorite hacks and putting them in one place. Happy to hear you found them valuable. And yes, definitely important to treat crew members well. Often, they’ll treat you well in return! 🙂 We sometimes make friends with the crew, as often times they’ll be surprised to learn that we’ve visited, or temporarily lived in, their home countries. It’s always a fun icebreaker for us. Funny, we do the same as you with our cabin steward. We’re not THAT messy that we need to have our room cleaned twice daily, lol. So we always let them know that it’s A-ok if they ever miss our room. This always seems lift some weight off their shoulders and is our little way of letting them know that we won’t be high maintenance. Hope you have a great 5th cruise in August. Enjoy! #18, 19, 24, 25… Among others… How to piss off the crew who serve you and come across as a grade-A cheap-o jerk. We talk about how awful you are in the crew bar every night. Really? I’m actually quite surprised by this comment. #18 Get your minutes refunded. When I spend 10 minutes ($5) for a page to load and it doesn’t load, I would expect to be refunded since I did not receive the service I paid for. If you ordered a beer at a bar and only received an empty cup, would you not complain to the bartender and ask for the beer that you ordered? #19 Ask crew for best wifi location. I treat crew members as friends, not servants. And so having a friendly chat with a non-busy crew member about wifi onshore doesn’t seem like I’d be putting them out much and it’s info I appreciate very much. #24 Order two entrees. The only reason why I even suggest this is because half of the servers we’ve had on cruise ships absolutely insist on bringing me two entrees despite me only wanting one. This often seems to make them happy to somehow over serve me. I’m actually on a cruise right now and it happened to me last night. I insisted on one, but he insisted on bringing me two because he really wanted me to try a dish he thought I’d like. #25 Request an entree as an appetizer. Again, this is another move that is often suggested by the servers themselves. I fail to see how this would make someone a grade-A cheap-O jerk. I realize that there can be some very rude cruise passengers and have witnessed it firsthand. I’ll apologize on their behalf if they have left you jaded and bitter, which it seems that they have. But not all of us are “awful” nor do I think these cruise hacks contribute to that. Cruise passengers are often spending large sums of money that they’ve worked hard for and saved hard for to be delivered an incredible experience. This post is an attempt to help passengers make the most of their experience and enjoy cruising, which I’ve received much positive feedback that it, in fact, does. I am confused about why crew members would mind letting a passenger know where to find wifi at higher speed or lower price? Yup, was also confused by that! Kiki, that sounds depressing that you can’t find anything better to discuss with your fellow crew members. I feel sorry for you, and those like you. Maybe some research, or a few visits to a therapist, could enrich your life if you could learn how to be more positive and appreciative. Or, if you really can’t learn to love and appreciate your job, what’s keeping you there? YOLO, find something you enjoy, perhaps. Be happy! These tips are amazing! I have never been on a cruise before but these will for sure insure I have an amazing time without having to hassle around much because of a lot the tips! Can’t wait for this trip now. Thanks for sharing! Thanks for the great ideas… you gave me a couple new ideas I never heard before. FYI, I’ve read multiple reports on Carnival that while power strips (in good condition) are permitted, surge protectors are not (and can be confiscated). Apparently the surge protection interferes with the ship’s electrical system. (The Belkin model you recommend is a surge protector, so it would not be allowed under this policy). Glad we could give you a few new ideas! Some of these tips are tried & true, so we’re always happy when we can share a few fresh ideas. Thanks for the heads-up about the surge protectors on Carnival. We’ve used this particular Belkin model on Celebrity, Norwegian, and Royal Caribbean and it has worked beautifully. I have not personally used it on Carnival and don’t know much their surge protector policy. However, I can report that a friend of ours used this exact model on a Carnival Cruise in November 2015. He reported that it worked fine on the Ecstasy and that it was not confiscated. So not sure if it may vary or perhaps they may just be looking to confiscate those big bulky surge protectors / power strips. Either way, thanks so much for the heads-up on this! I’ll send Carnival an email to see if they can provide a finite answer. Did you get an answer to this from Carnival? We frequently travel on Carnival and have purchased two of the units that you recommend for future cruises on RC and NCL. I’ve recently started a blog targeted at cheap around the world cruising for retired folks and I’ve been planning an example 1 year cruise for < $50 per day. I've been using the VacationsToGo.com searches and sorting by the nightly cost as you describe, and then I've also been using other search tools looking for 7 day cruises for < $500 which some cruise engines will let you do in an advanced search. By the end of the year I'm planning to deploy my own search engine and app that will automate a lot of the process of planning a year long cruise staying under a user specified per night budget. Hey John! Thanks so much for stopping by our blog. We wholeheartedly agree with the incredible value of cruising. Although we haven’t been able to get as much out of the dance courses as you have. We tried learning Tango on a repositioning cruise to South America and failed miserably. I totally blame our lack of coordination and not the dance instructors, lol. And $700 pp for a balcony on a 15-day Celebrity cruise is reason enough to splurge on some cocktails in our opinion! That’s fantastic. This search engine and app that you’re describing sounds brilliant. Feel free to send us an email if you need any beta testers. Love the concept! All the best on the development and we’ll keep abreast on the blog. Happy to connect and happy travels to you too! Any more word on the cruising around the world app? We are both retired and looking to add it to a future cruise. Have 3 in the works right now, but want to do an around the world. Went on a ladies trip sharing cabins with different relatives. One of them brought those little jars of poo-pouri and handed them out as gifts to each lady. They were a hit and worked like a charm! Hey Jaquel, thanks for the comment. What a wonderful gift idea and a great way to keep the cabin smelling fresh, thank you for sharing! Room service breakfast is free on Royal Caribbean so long as you don’t request delivery during off hours (midnight to 5 am I think). Not sure about other room service food options but it’s great to avoid the crowds and get off the boat early on port days! Wow. These are fantastic. I have bookmarked this awesome resource for future reference. Can’t wait until my next adventure now. Thanks so much! Thanks for the feedback. Its so nice to hear these tips are proving useful! Hope you enjoy your next adventure wherever that may be. Happy travels! I would like to find out which cruise lines have it so you never have to get all dressed up for dinner. We are more simplistic and would like to keep everything very casual. Thank you for any input you may have. We share your sentiments and Norwegian cruise line is probably best for that. They don’t enforce a formal night like most other cruise lines. On NCL, they tend to have one night during the cruise that you dress up only if you want. Most other cruise lines you can still go fairly casual except for the planned formal nights.